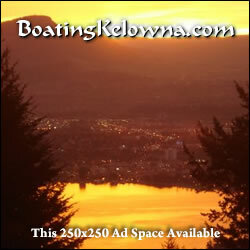 Click any star on the map to the right, or link in the article below, for a look at photos taken around that particular area of interest. 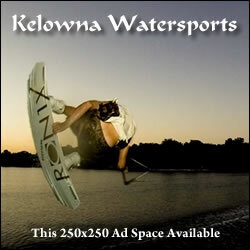 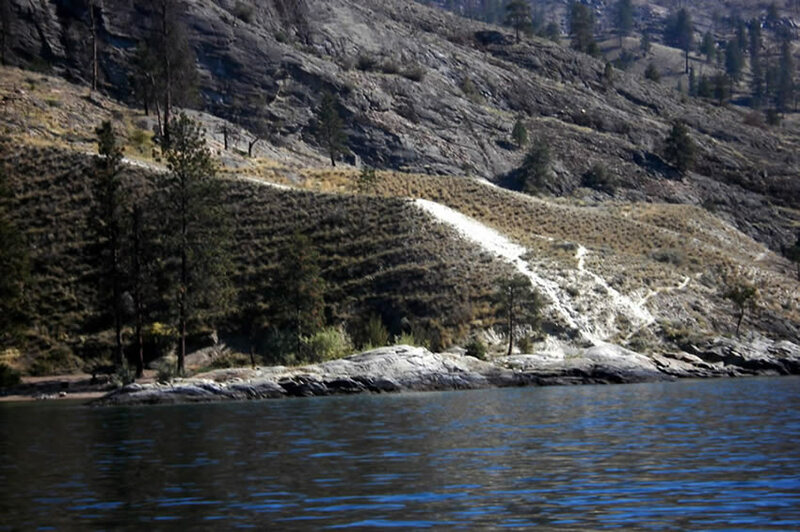 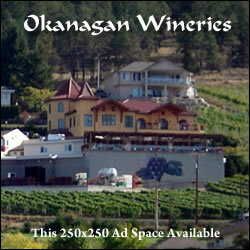 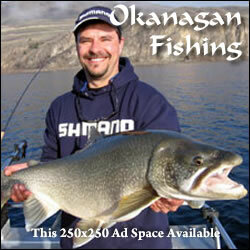 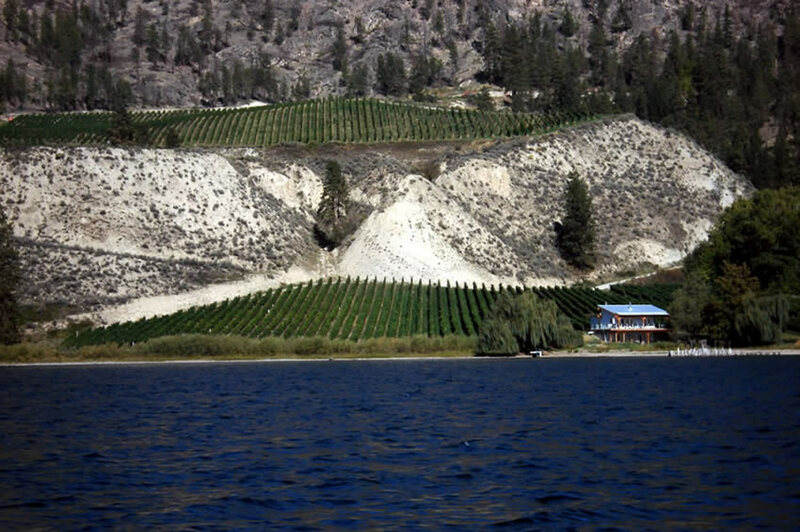 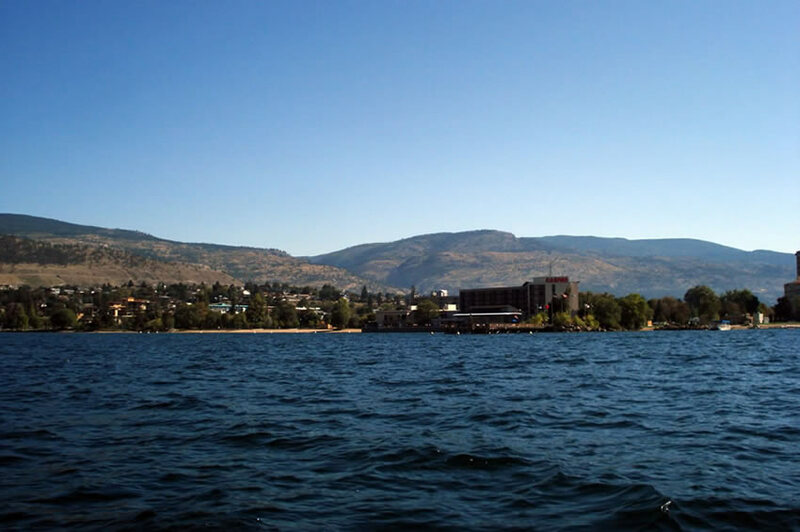 We begin at Okanagan Lake's south end, where the City of Penticton sits between it and Skaha Lake to the south. 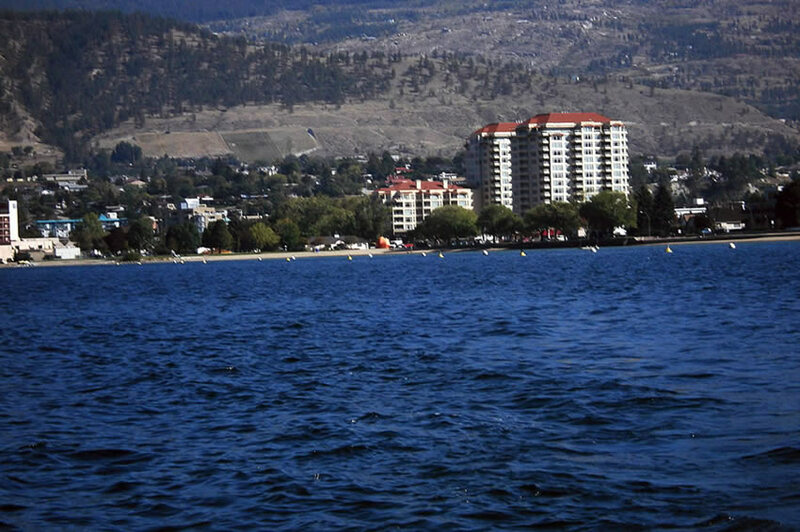 The beaches in Penticton are long and sandy, and get very busy during the summer months. 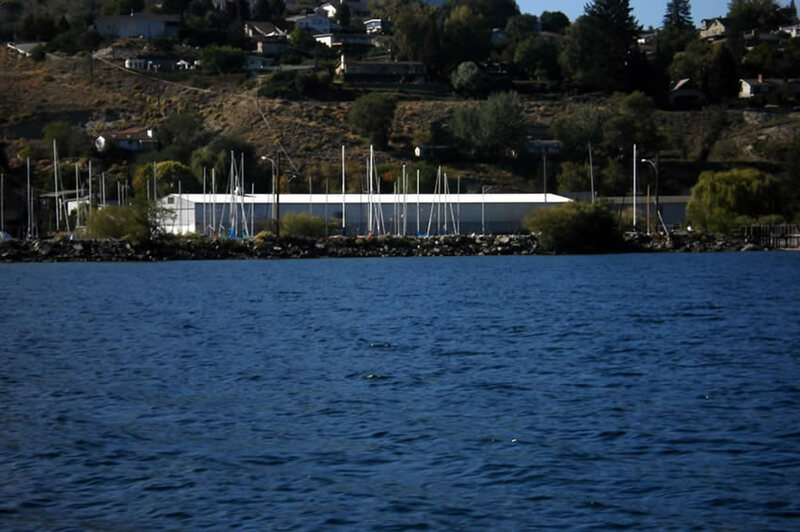 The Penticton Yacht Club offers a few transient slips for temporary moorage, close by its fuel dock and a boat launch. 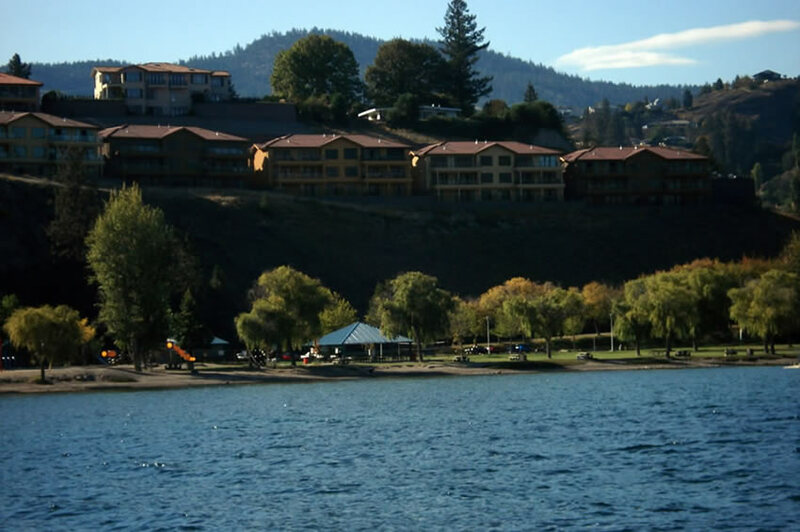 Motel accommodations and popular restaurants face the sandy beaches. 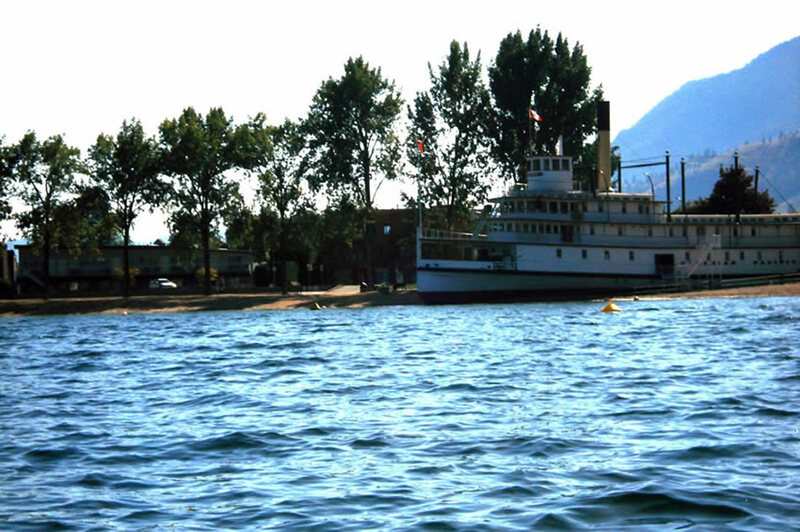 At the southwest corner of the lake sits the retired S.S. Sicamous, a paddle wheeler that transported passengers and supplies up and down the lake for over 30 years. 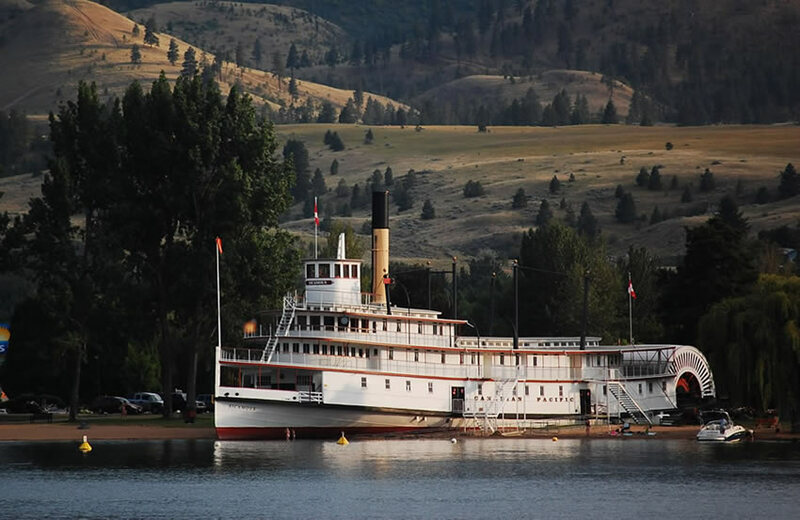 Nowadays it’s a museum, dry-docked on the beach. 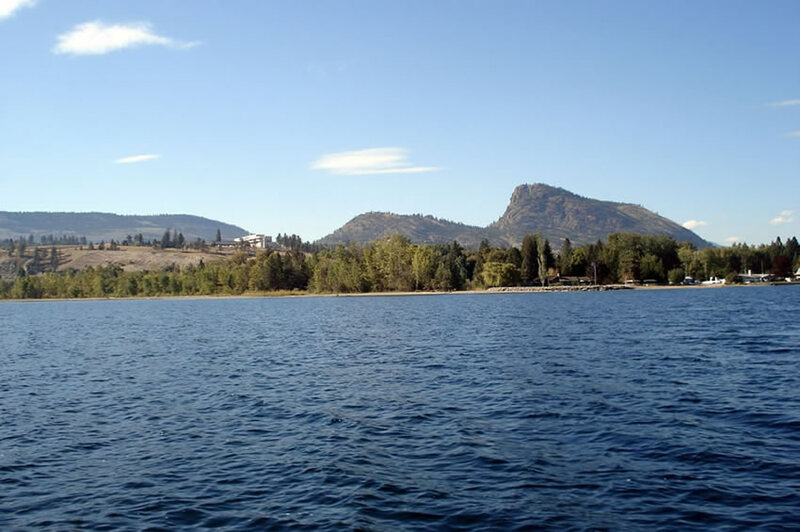 As you head north on Okanagan lake, you will see Hwy. 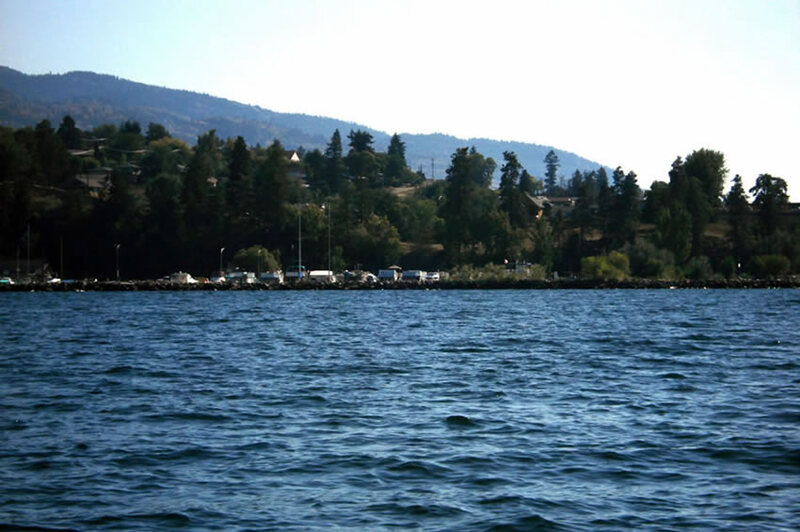 97 running along the west shore. 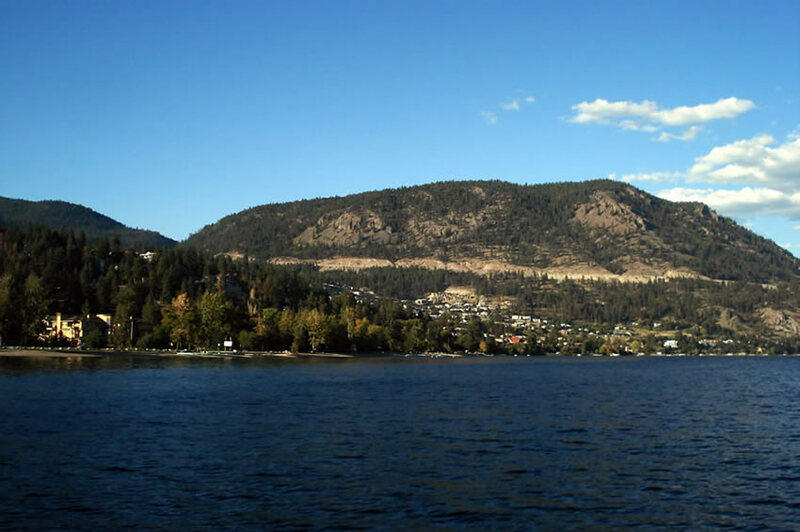 In a car, it’s a scenic drive up the lake past Summerland, Peachland and the Westside on your way towards Kelowna. 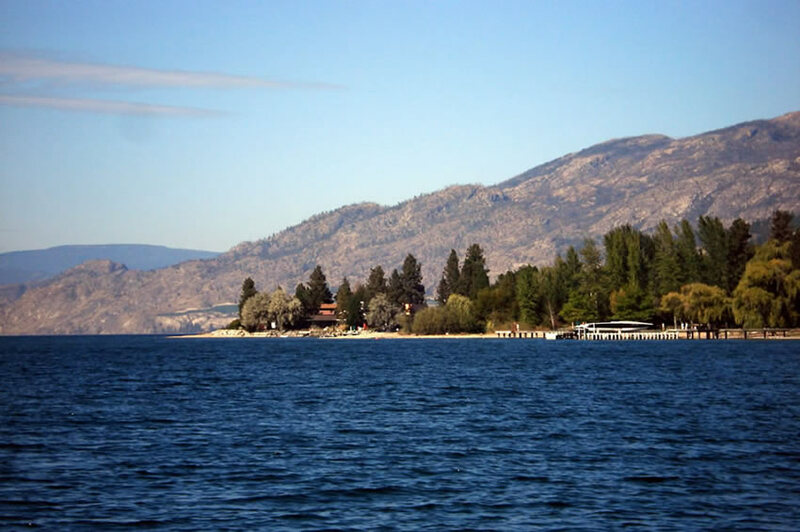 Between Penticton and Summerland are several parks and beaches for picnicking and swimming – great stops for lunch or for views of the lake and its eastern shores. 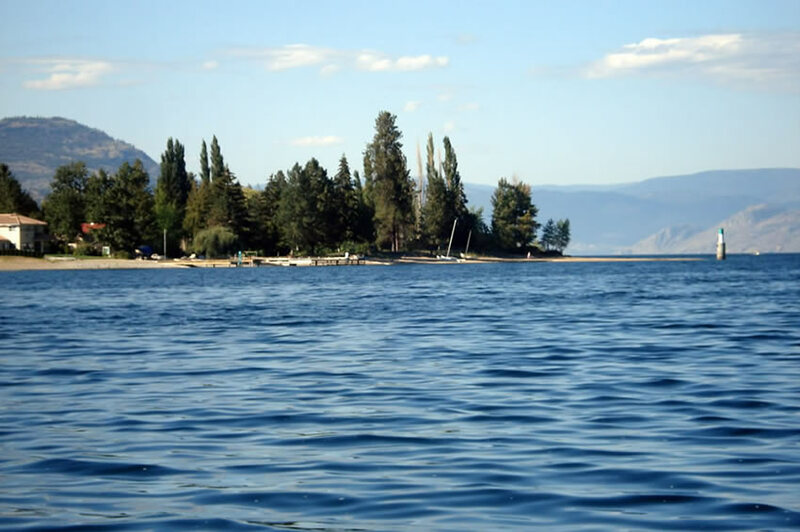 A very popular day park is Sun-Oka Beach Park just south of Trout Creek, with washrooms, a playground and a beautiful sandy beach. 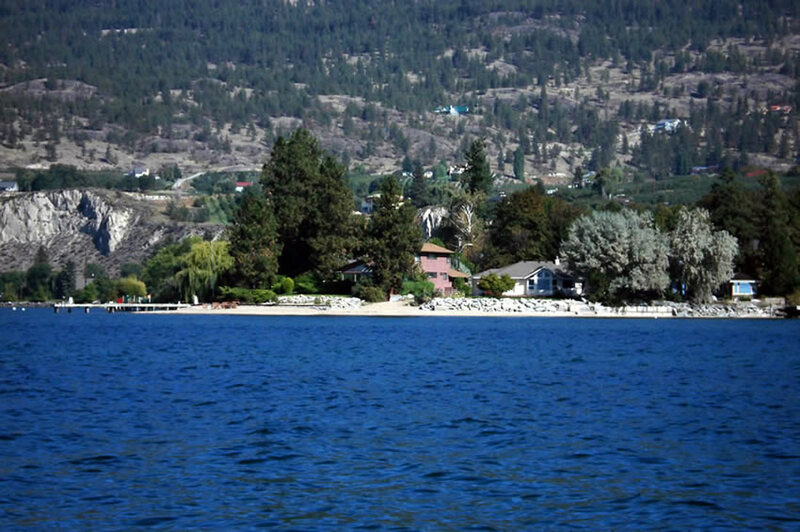 A small area at the south end permits boats, but the rest of the beach is protected for swimmers and kids..
Highway 97 passes through Summerland up above the lakeshore on its way to Peachland and Kelowna. 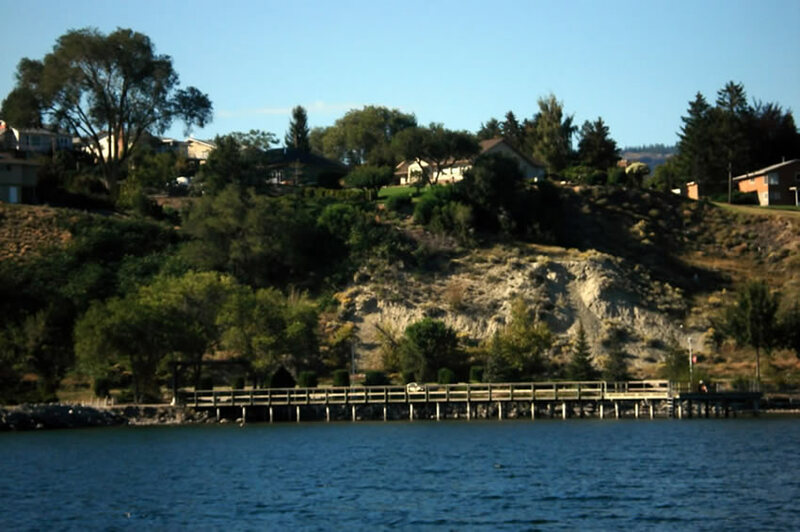 There is a scenic drive along the shoreline below Summerland that takes you past waterfront homes, parks, a boat launch, small businesses and the Summerland Yacht Club. 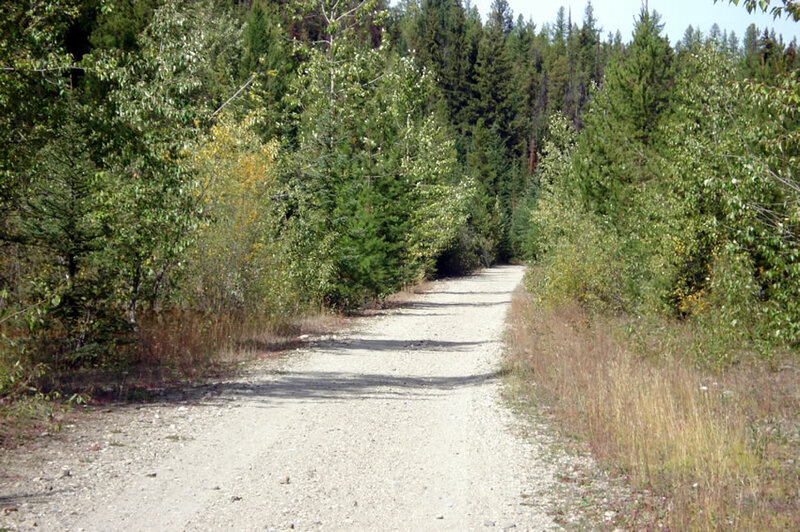 Here, before the roads were built, the C.P.R. 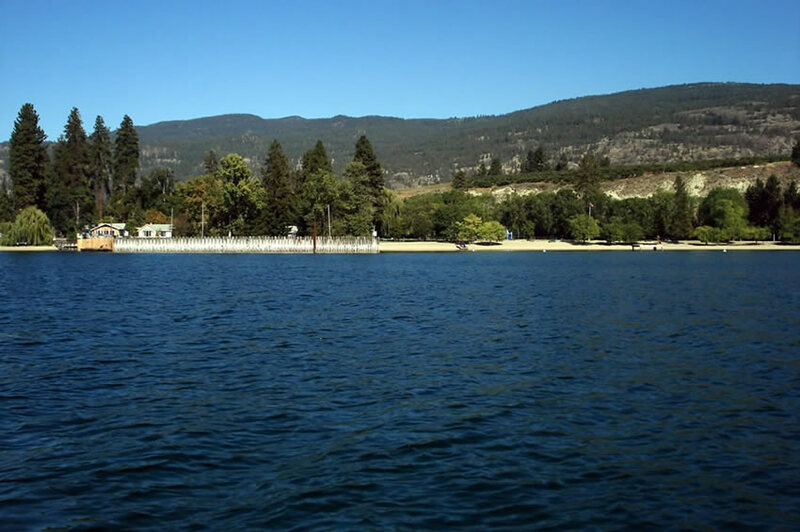 built a wharf where the early paddle wheelers picked up goods and passengers for transport up and down the lake. 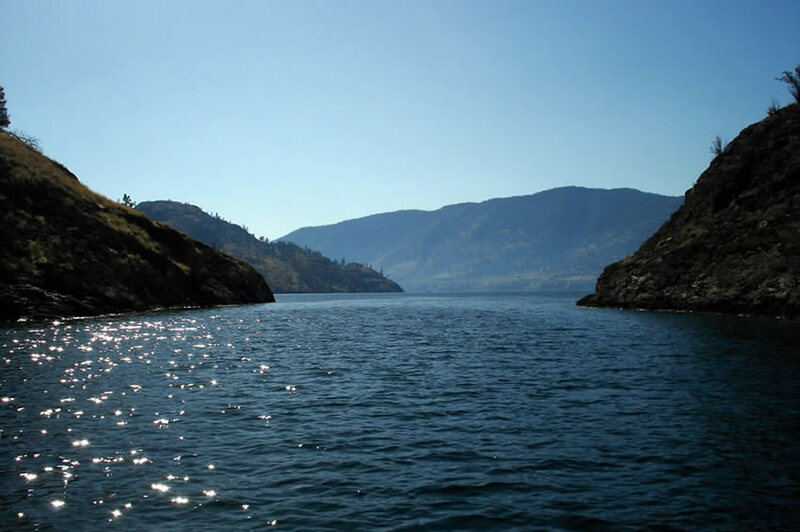 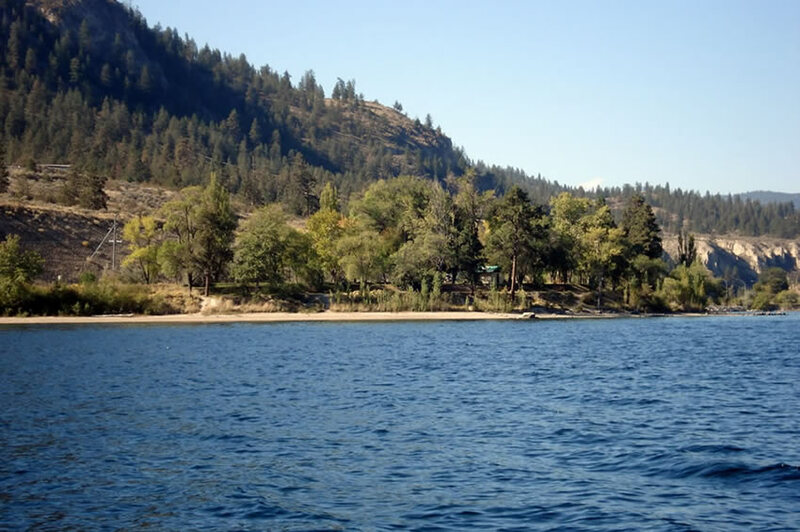 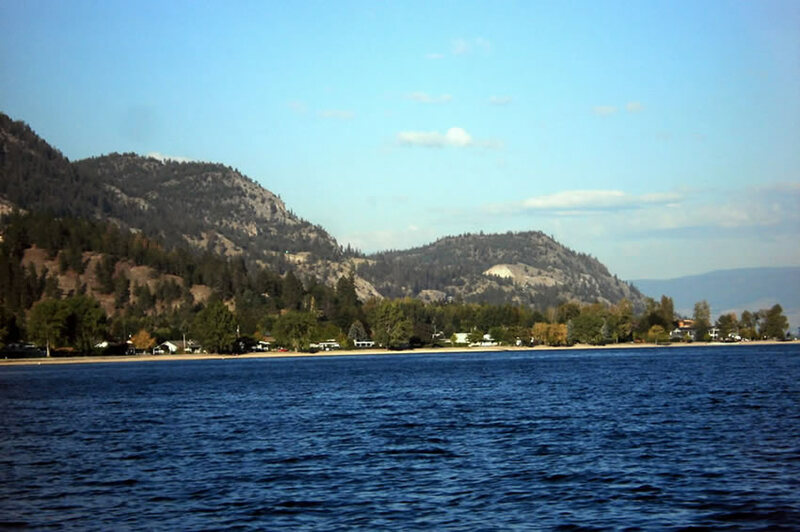 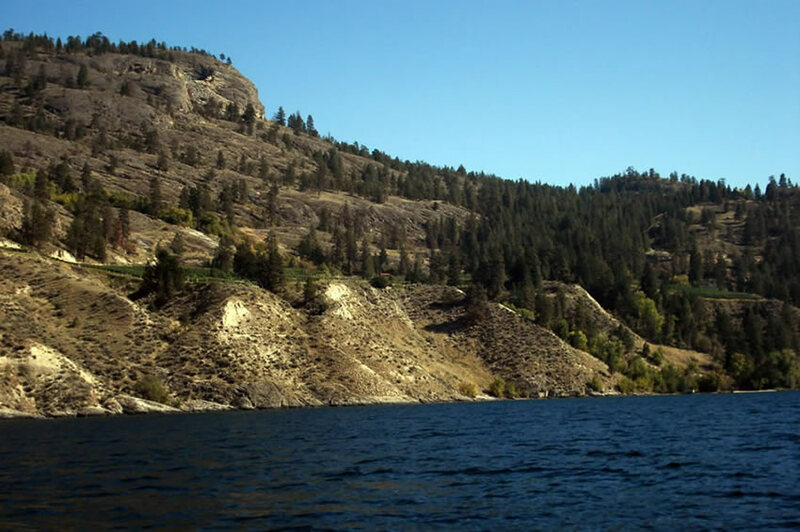 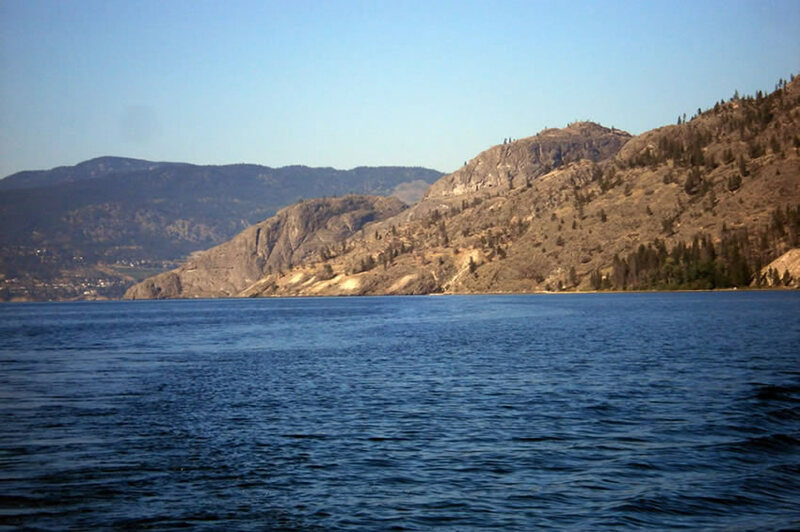 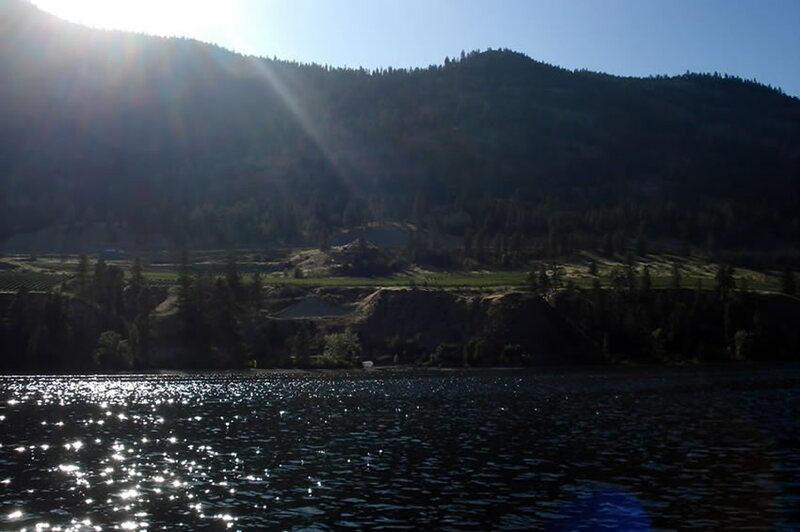 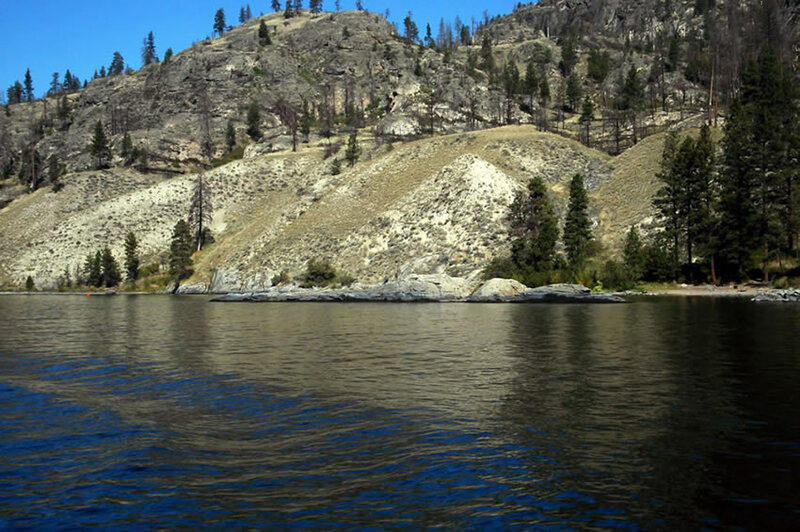 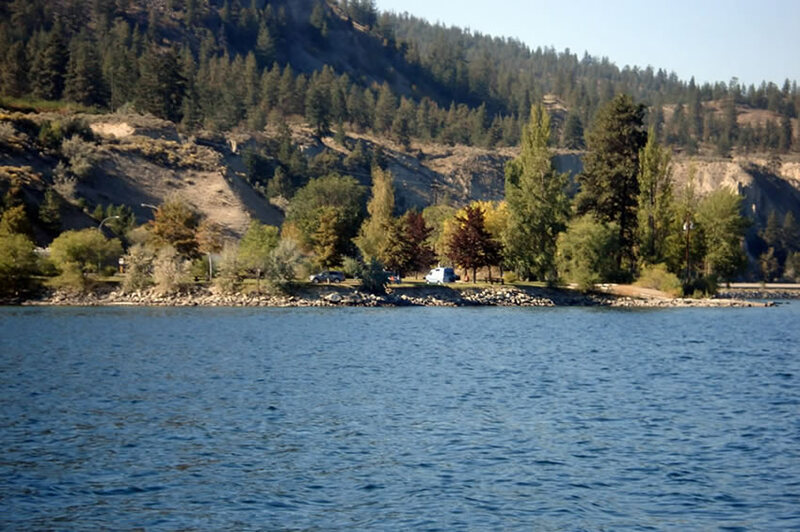 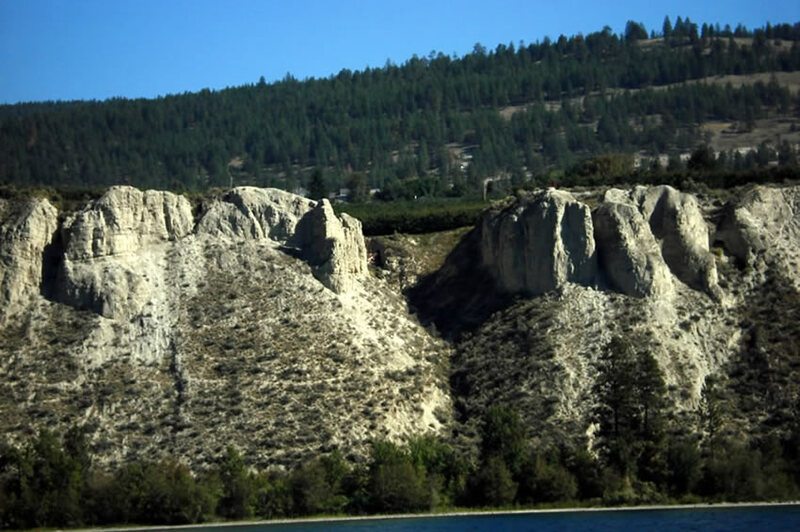 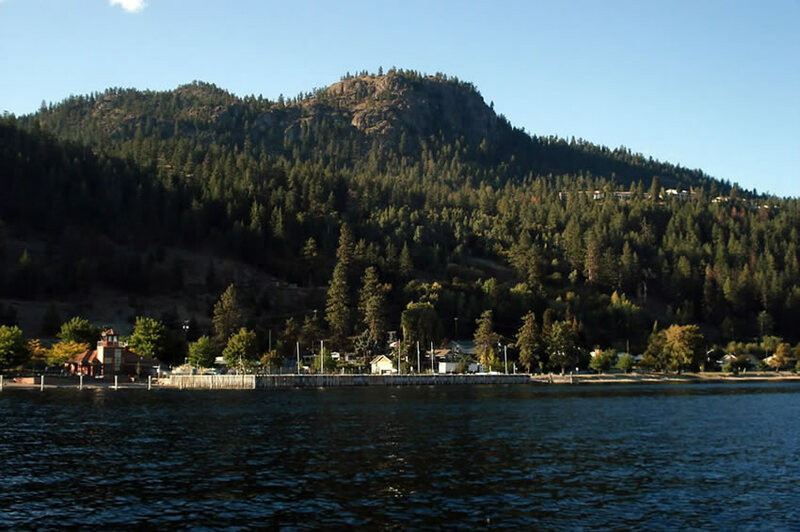 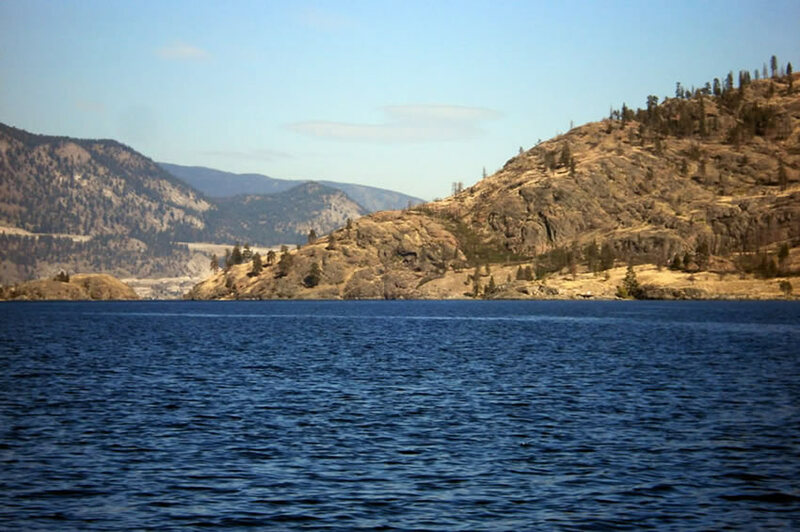 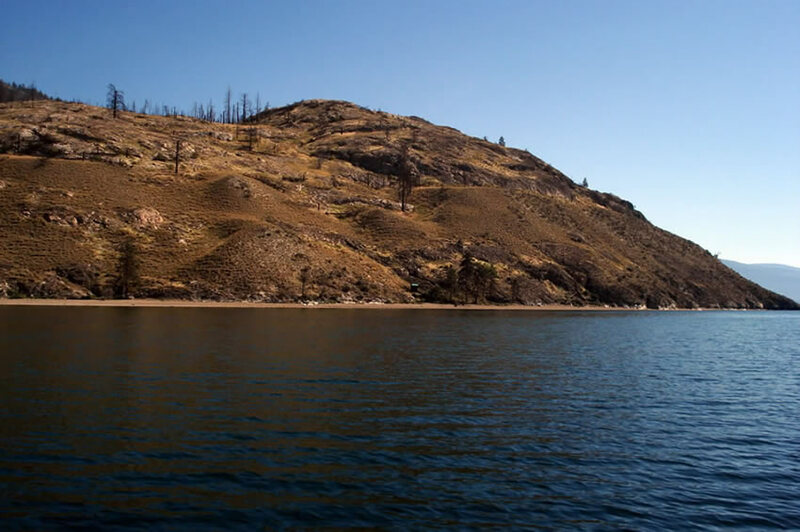 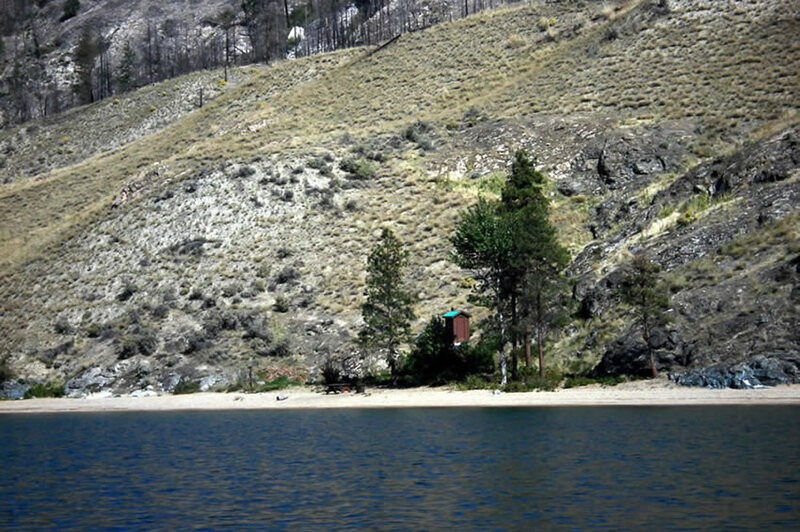 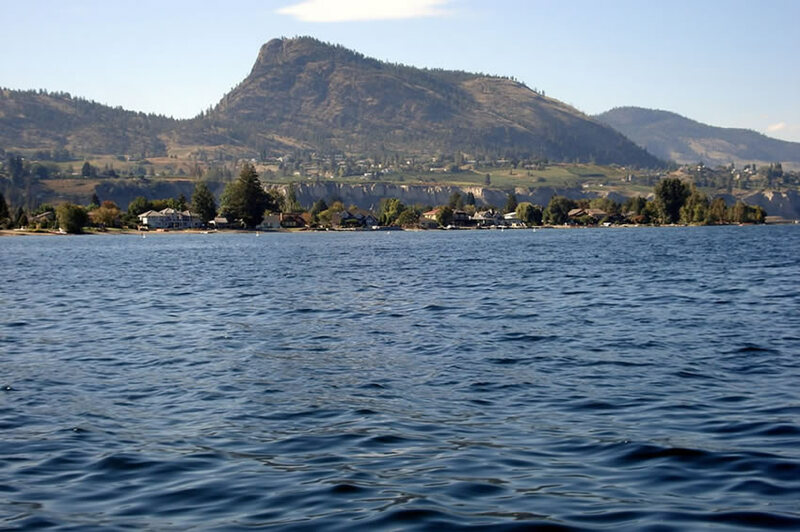 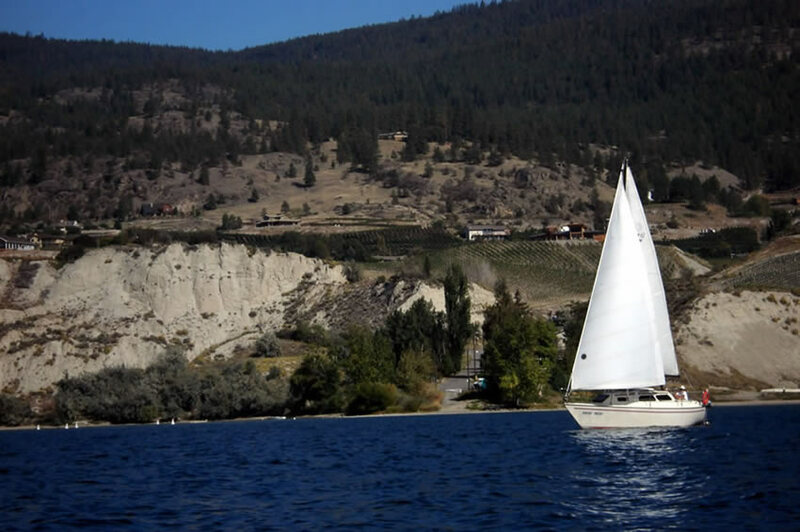 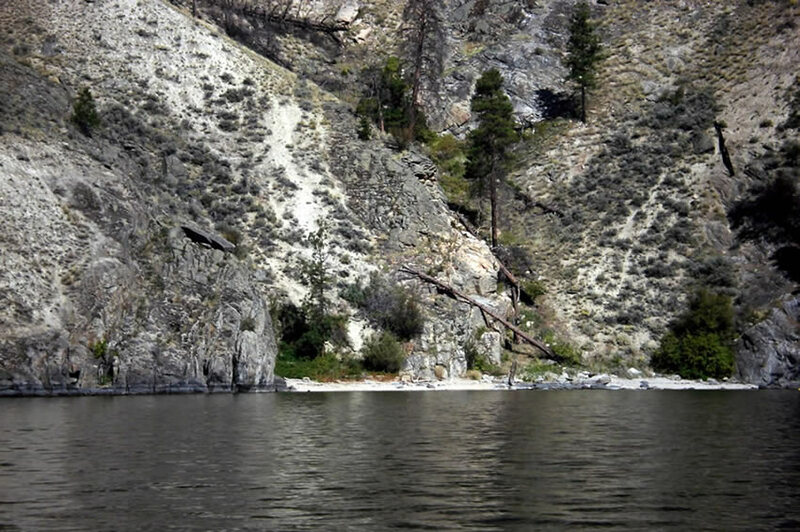 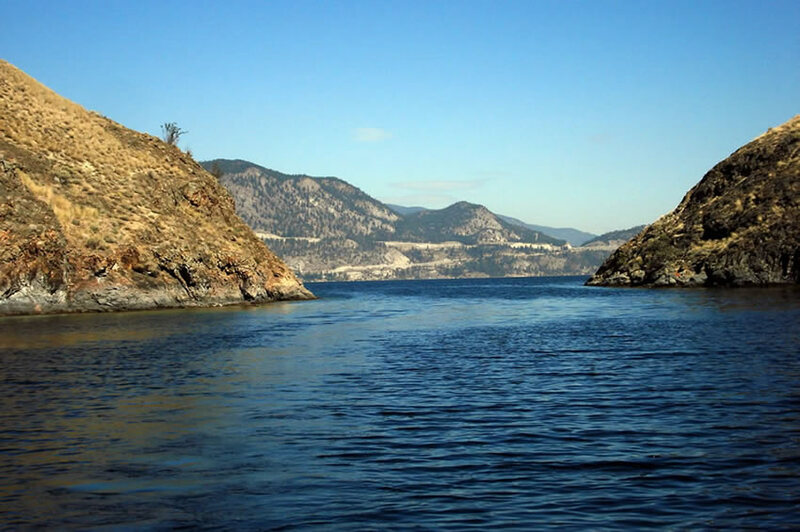 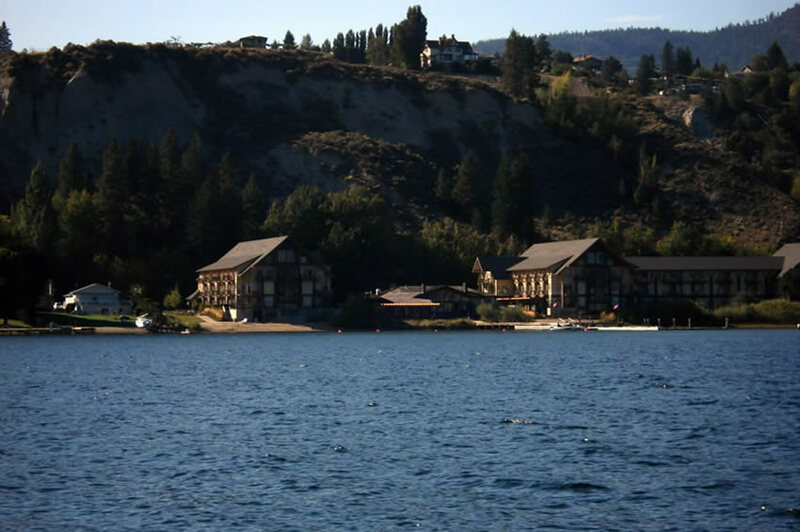 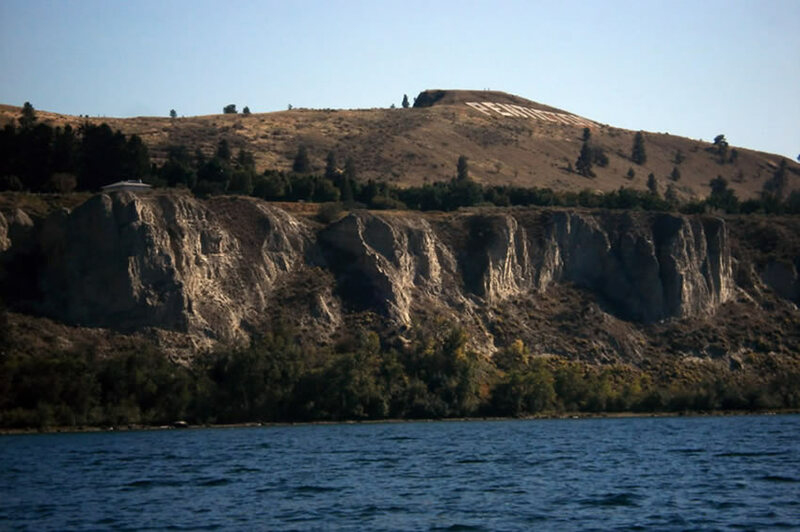 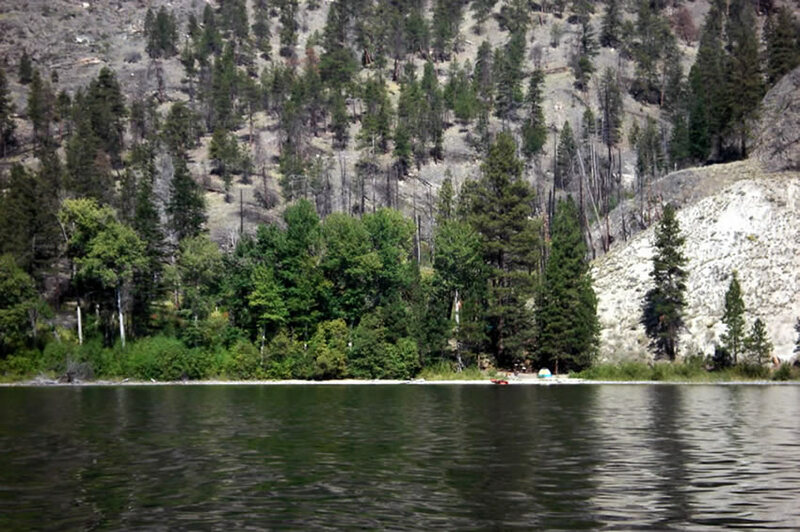 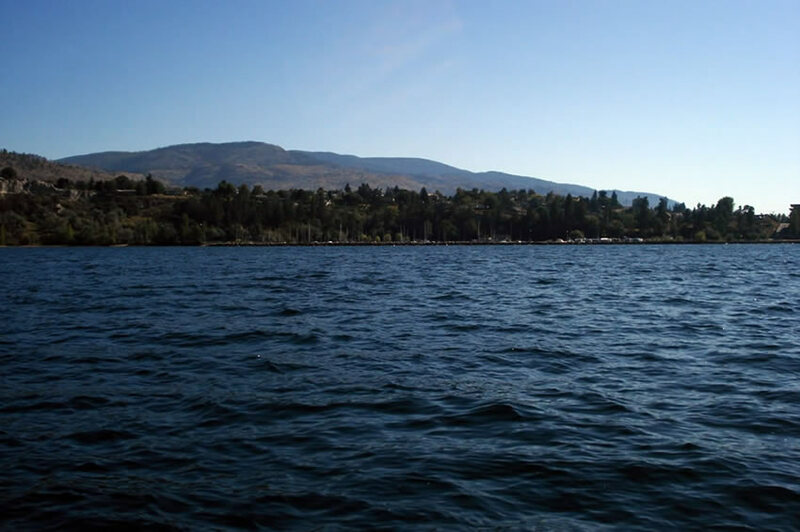 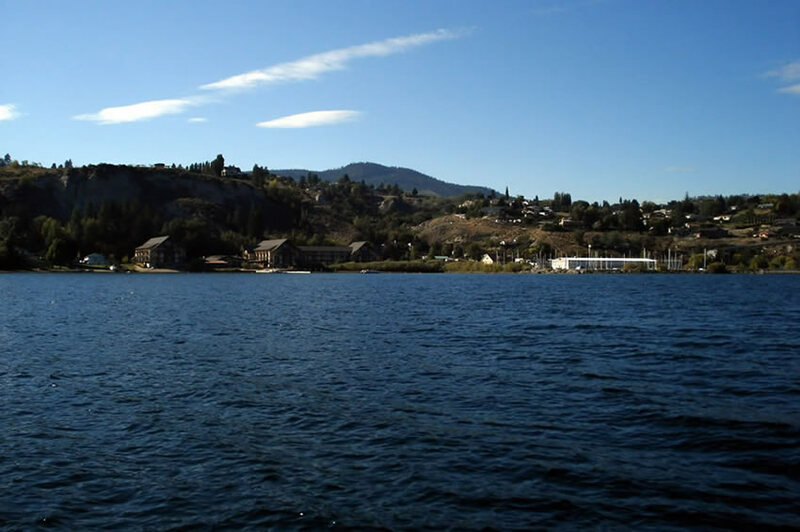 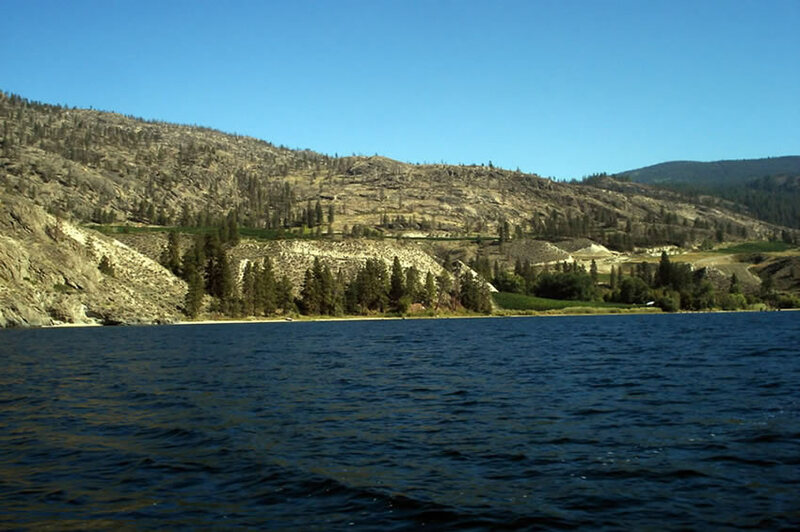 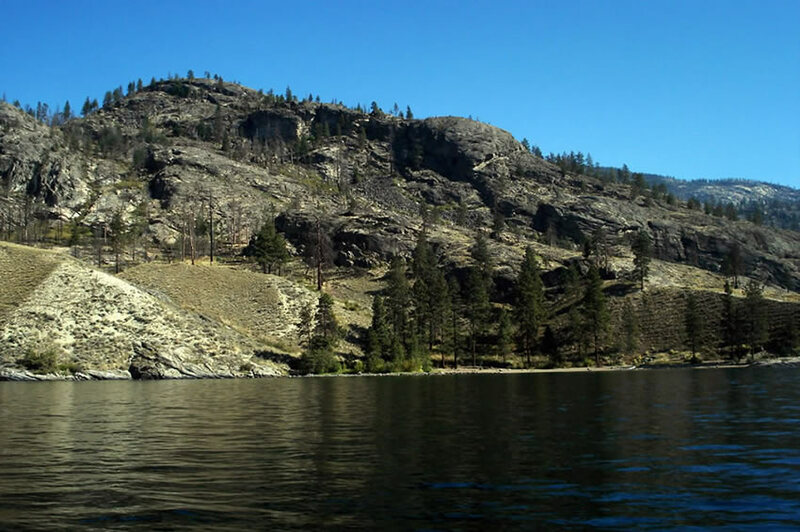 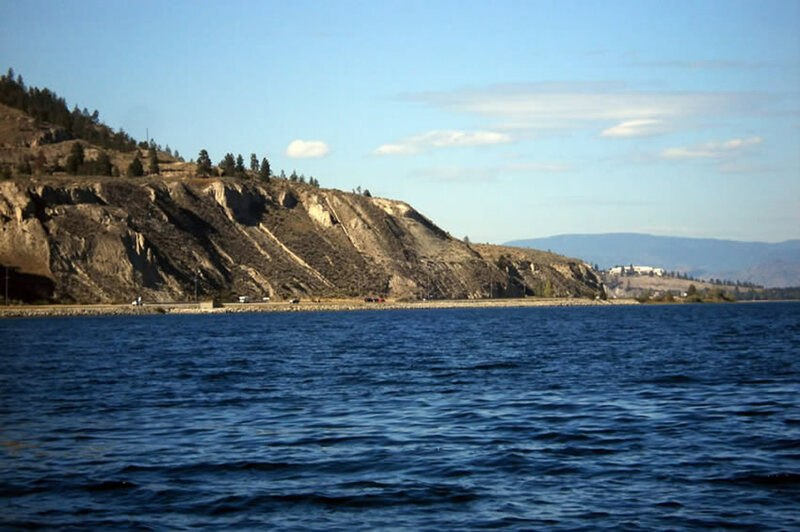 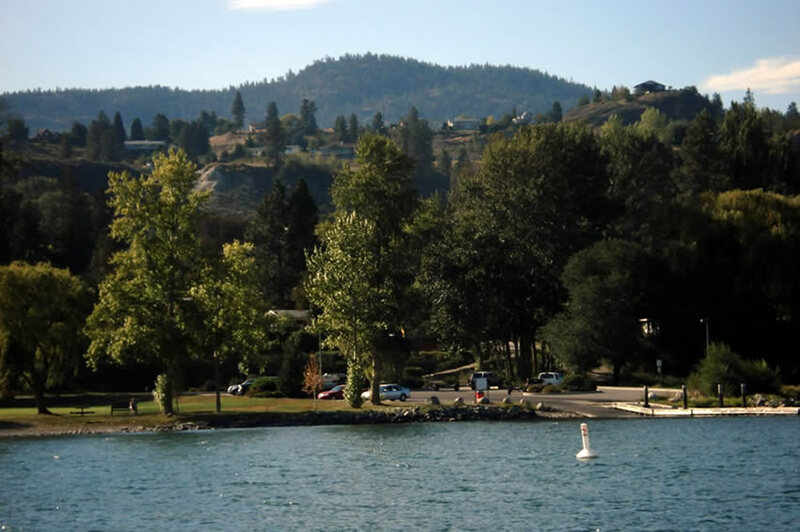 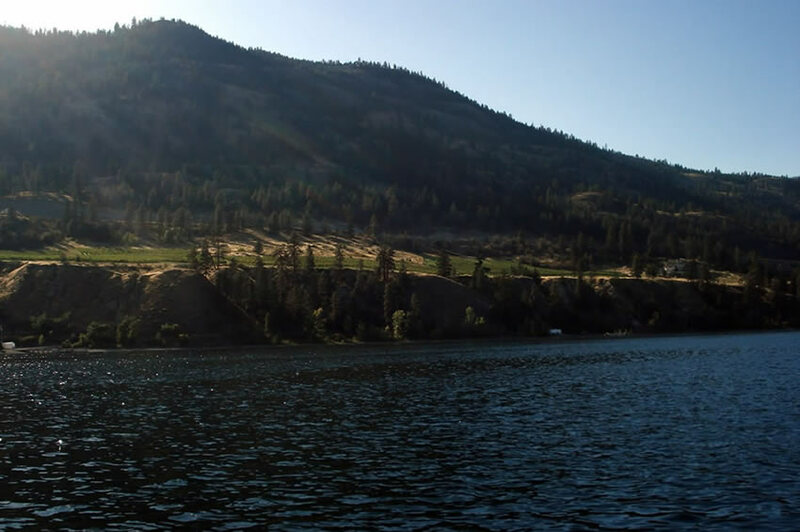 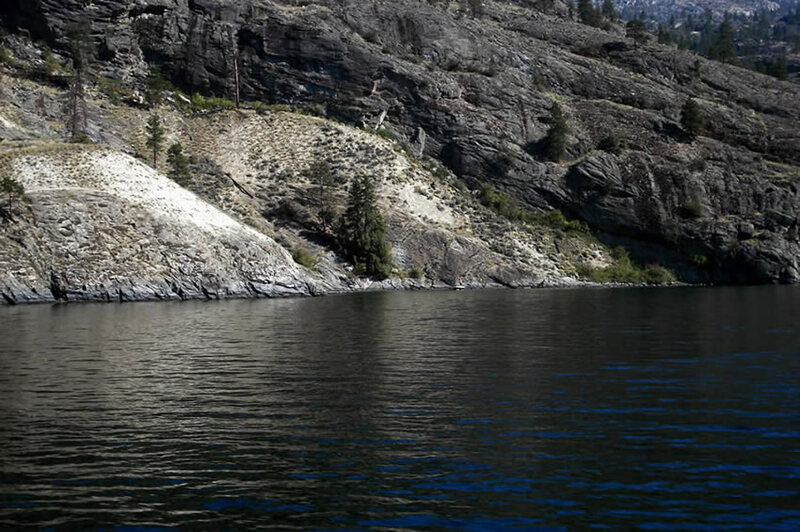 North of Summerland is Okanagan Lake Park, a provincial campground that is very popular in summer, and features a boat launch, beaches and abundant spots for water sports. 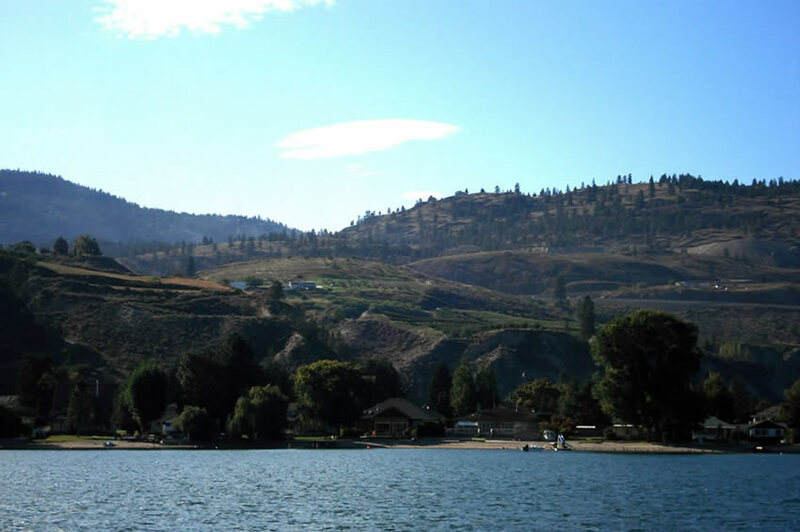 Further north along Highway 97 is Greata Ranch,another vineyard and housing development. 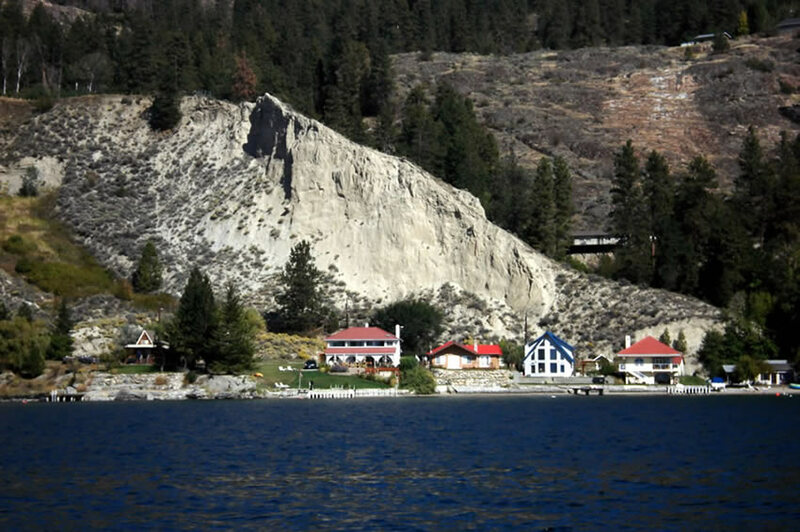 The shoreline below it is quite rugged, and scattered with waterfront homes until you reach Antlers Beach, a point of land where the highway comes down off the hillside and returns to the water’s edge. 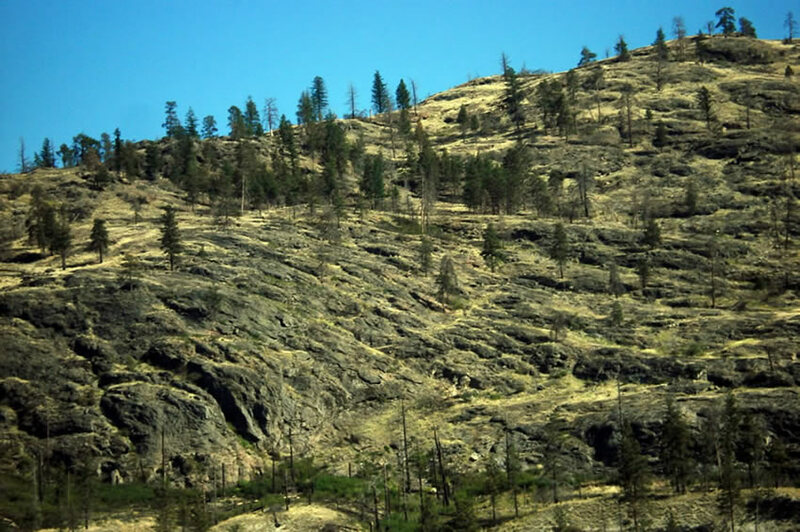 This area should be avoided when the wind blows hard out of the south. 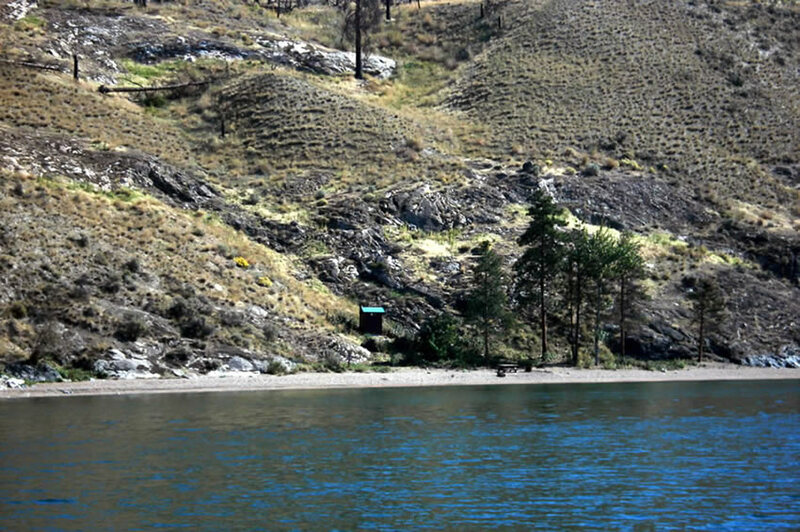 Large rollers hammer onto the beach. 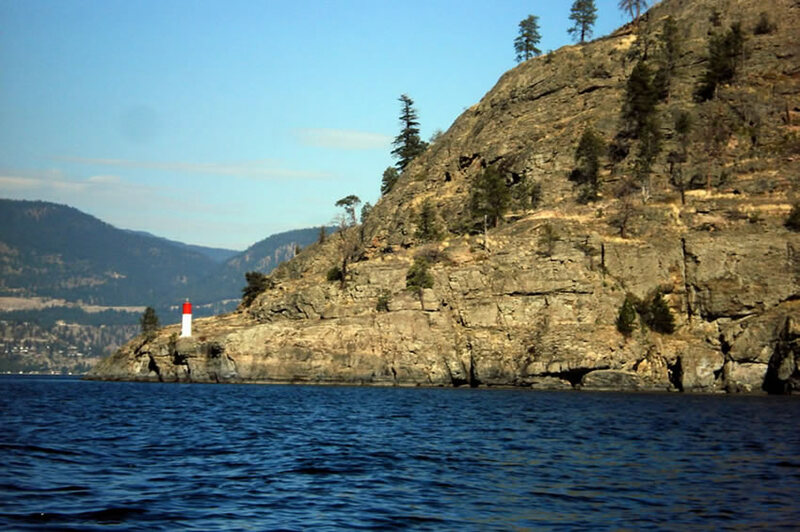 During certain months of the year, water funnels or spouts can be witnessed rising hundreds of feet into the air off this point. 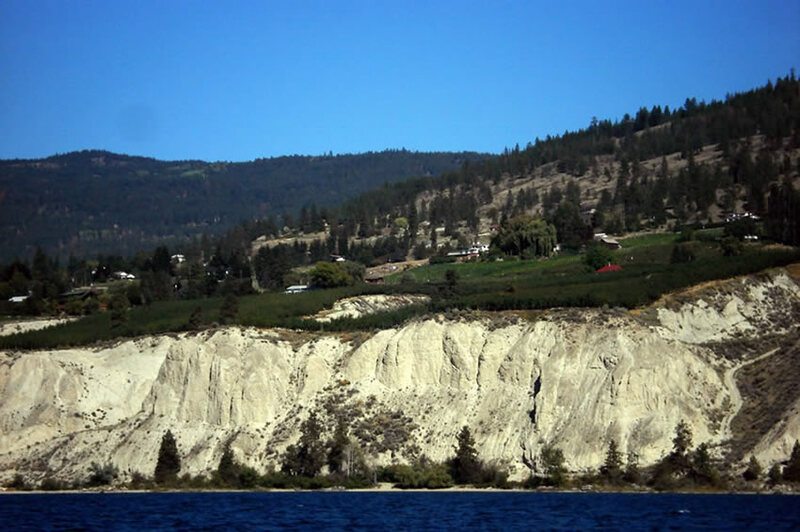 Just north of Antlers Beach is Peachland. 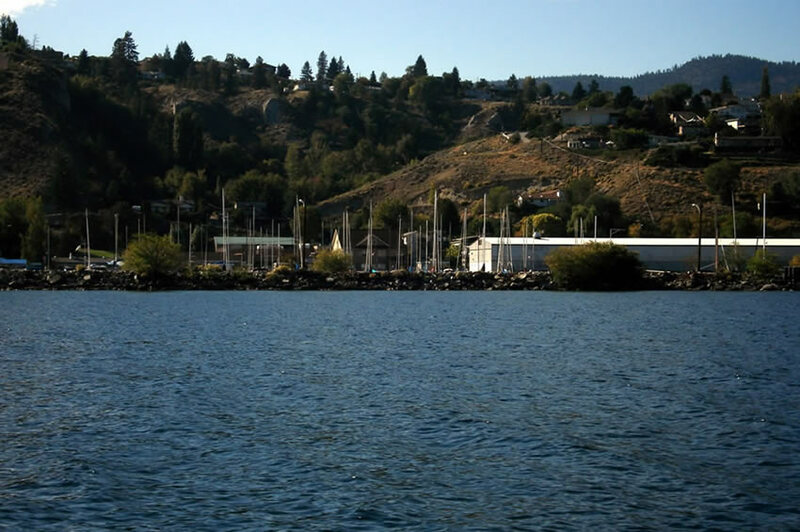 Here you can find a boat launch, boat fuel, restaurants, groceries, liquor store, artisan's shops and some public docks. 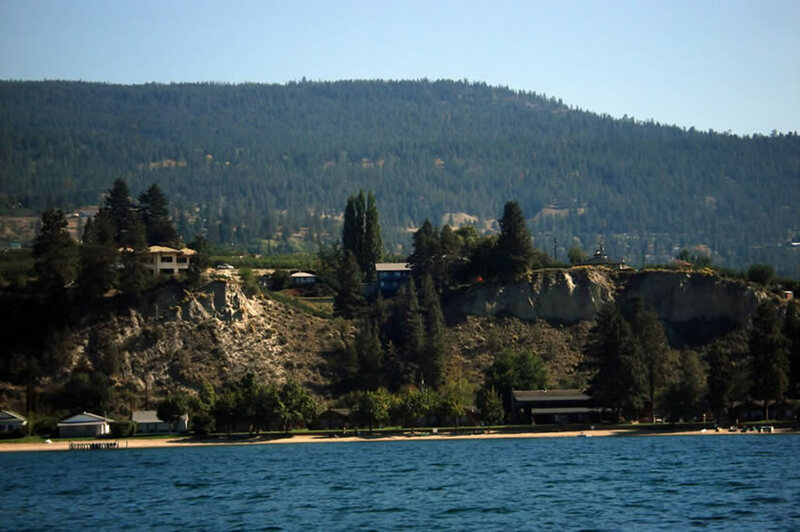 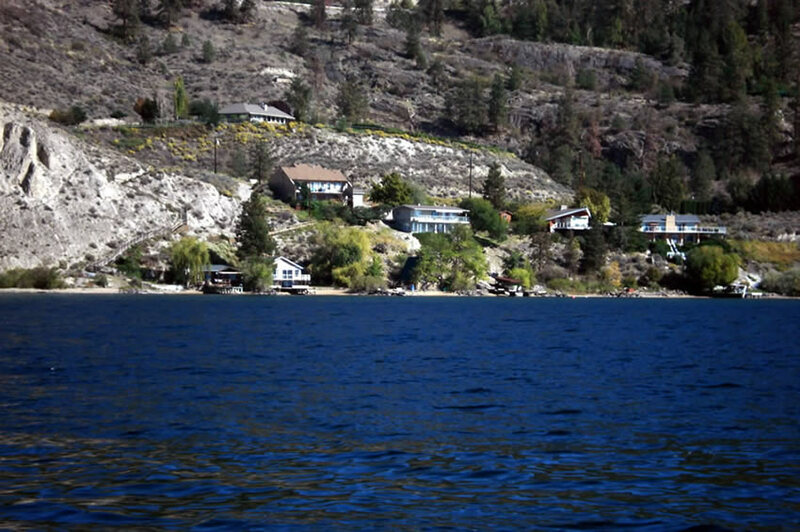 Mixed with newer homes that stretch along Peachland's shore are waterfront summer cottages dating back more than 60 years – giving visitors a glimpse of the summertime Okanagan lifestyle of generations past. 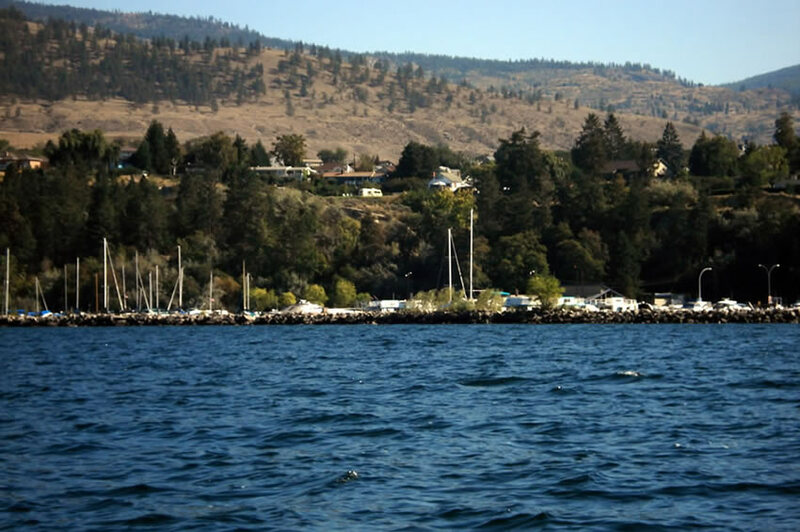 Heading north from Penticton along the southeastern shore, you pass the Penticton Yacht Club, several vineyards, waterfront homes, a few public beaches and a boat launch. 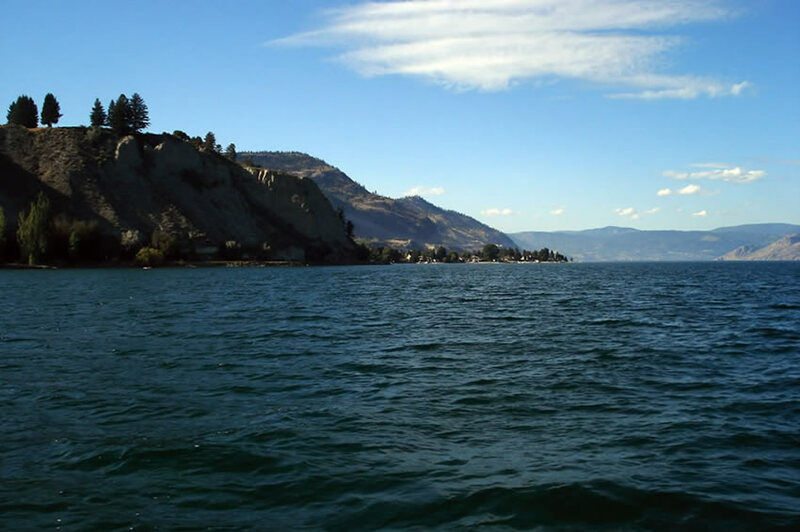 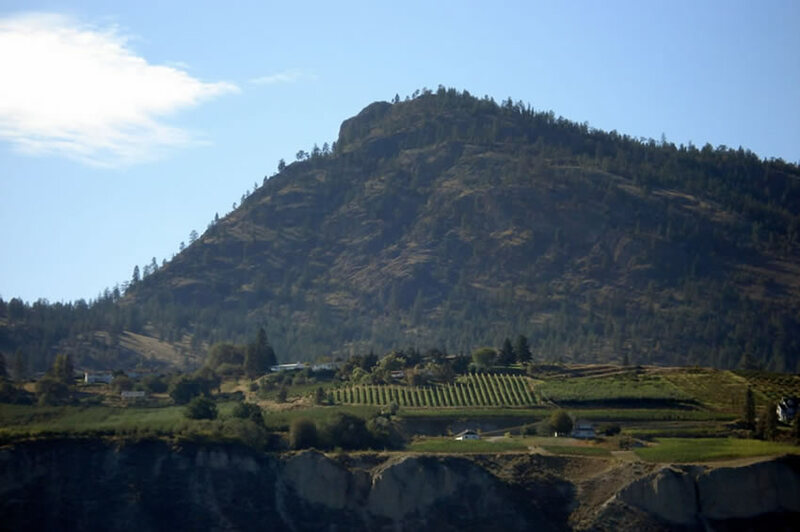 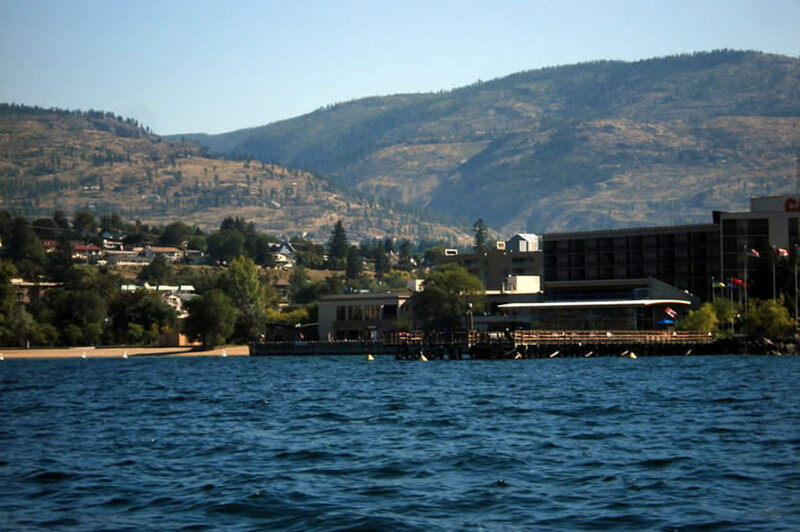 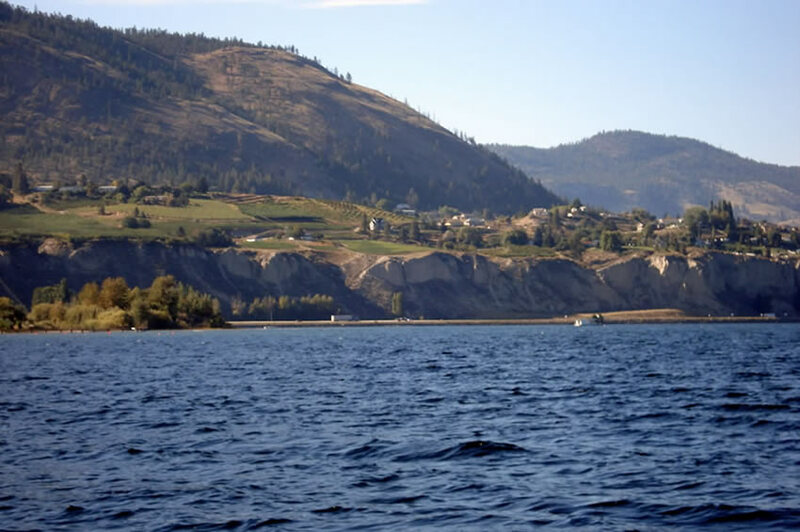 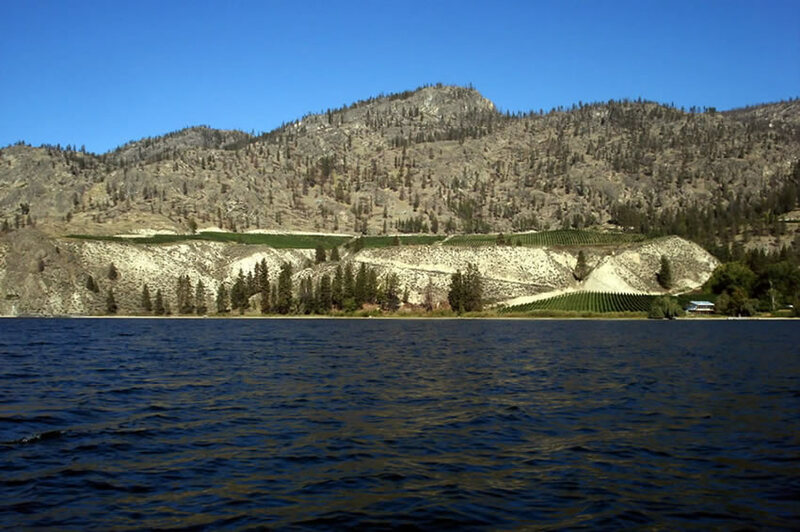 Heading north, you pass below the stunning Naramata benchlands where many excellent wineries invite your tasting and dining, before reaching the little hamlet of Naramata – a quiet, little community with an old hotel, a general store and a yacht club. 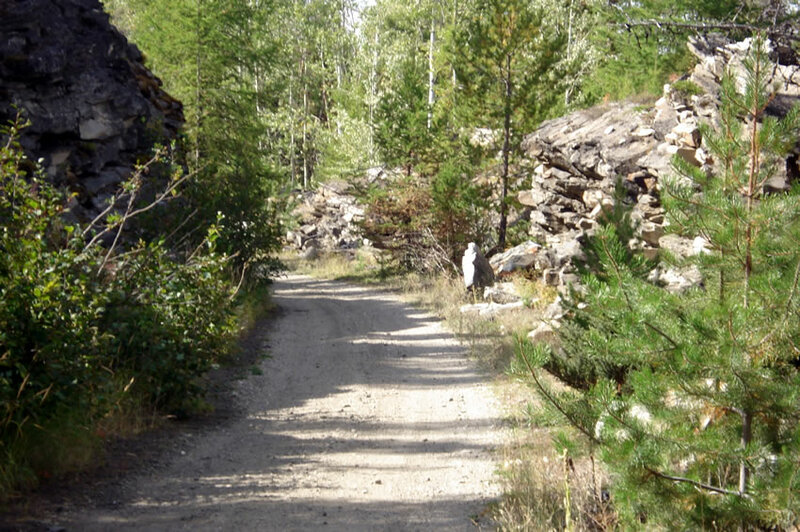 Past Naramata is a gravel road going high up into the mountains,along the famous, abandoned Kettle Valley Railway connecting Penticton to Kelowna. 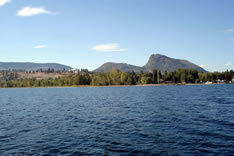 Just north of Naramata is the beginning of Okanagan Mountain Park, the area where destructive fires raged in the summer 2003. 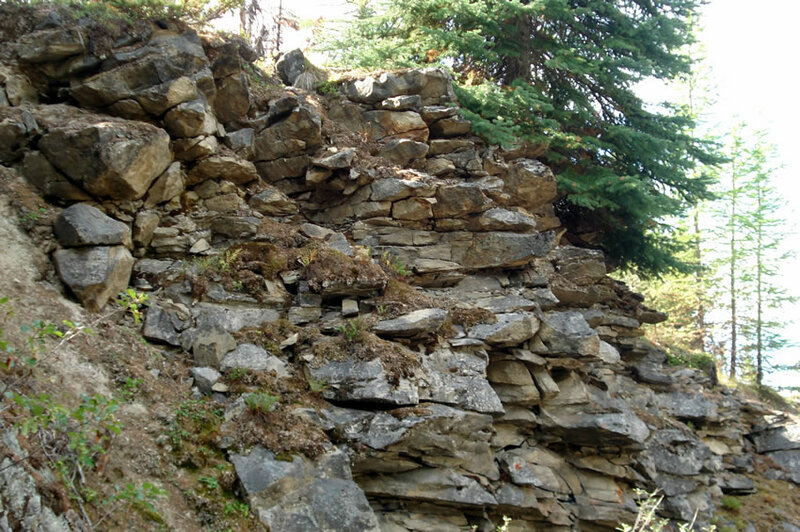 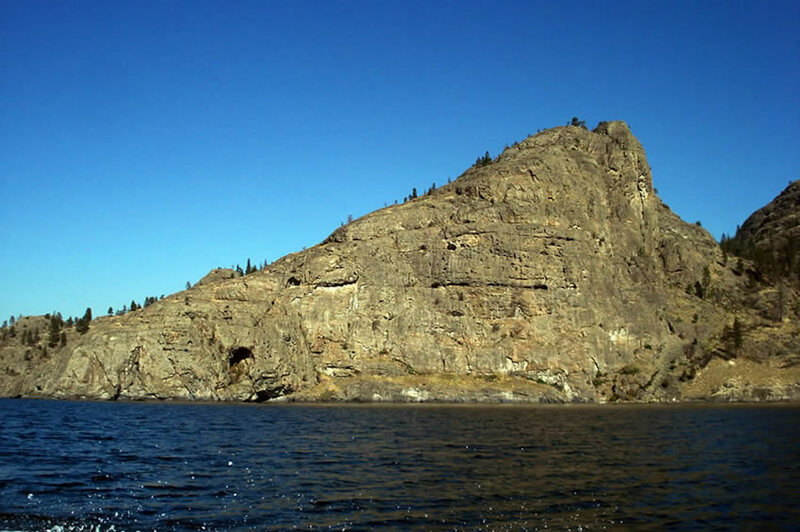 The lakeshore is very rugged along here, with steep cliffs and little bays. 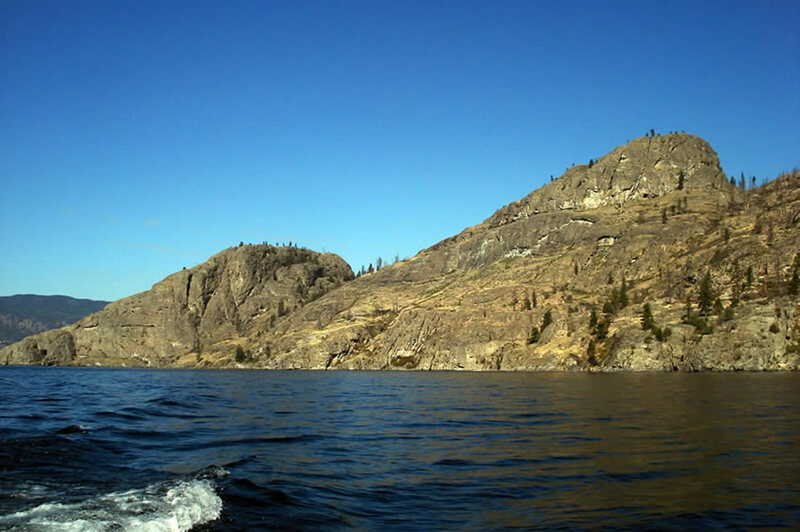 You next pass by a great cove called Commando Bay, where specially recruited Chinese Canadians were secretly trained by the British to fight the Japanese in special missions in South East Asia during World War II. Today, the bay is a very popular diving destination. 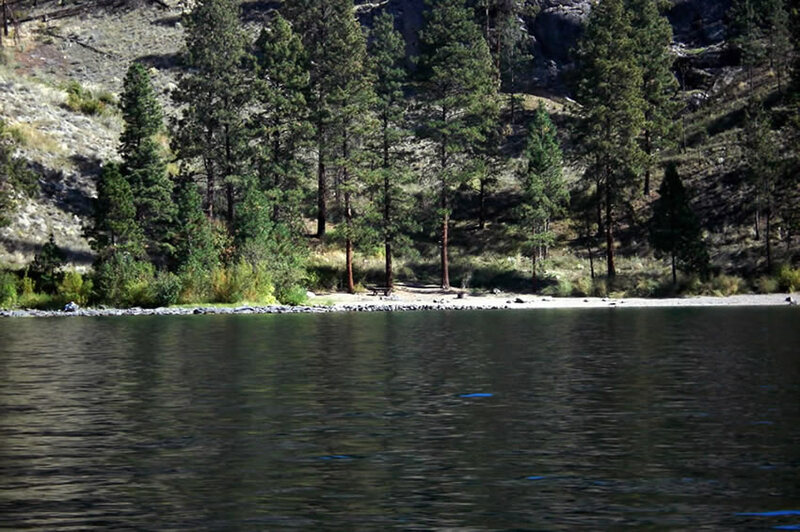 There are a few mooring buoys just north of it, right below Wild Horse Canyon. 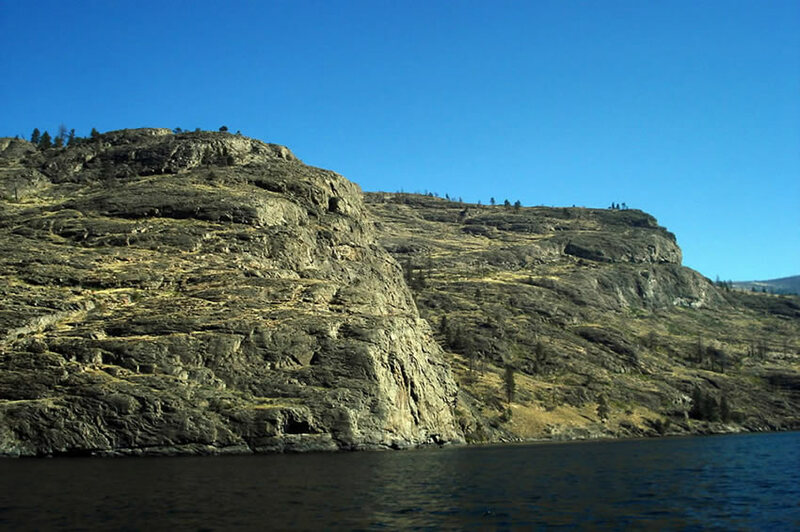 An outcropping of amazing steep cliffs look down upon you before you round Squally Point. 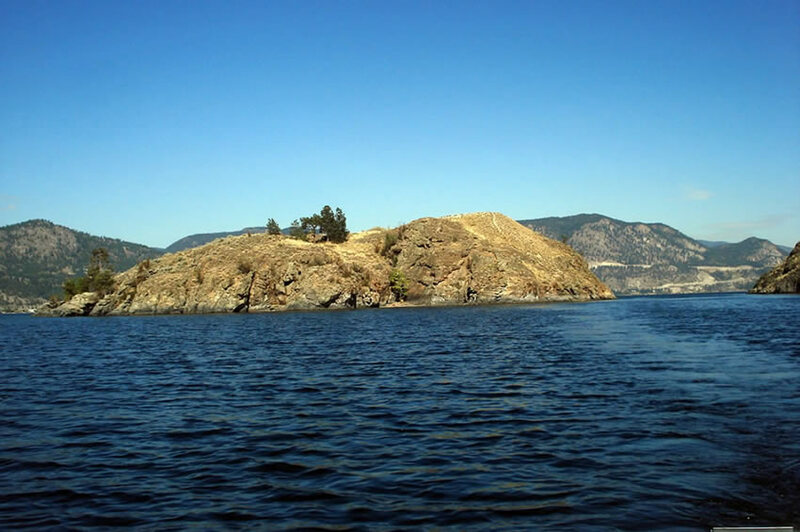 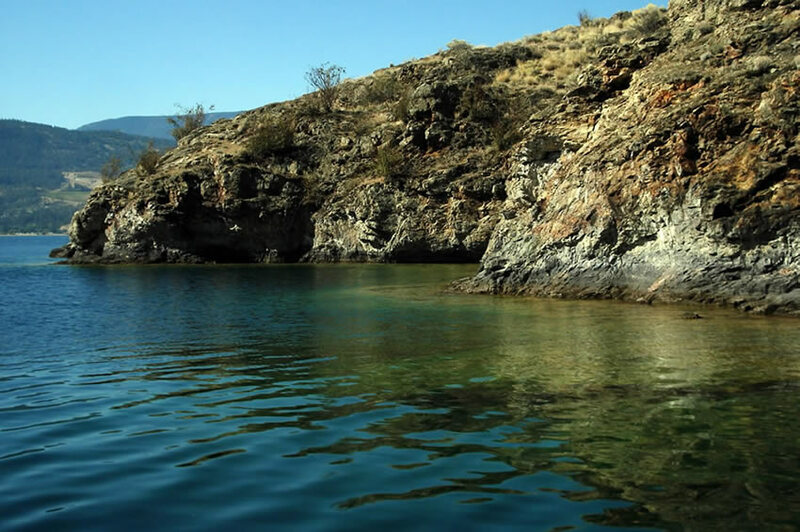 Squally Point is said to be where Ogopogo lives in a deep cave. 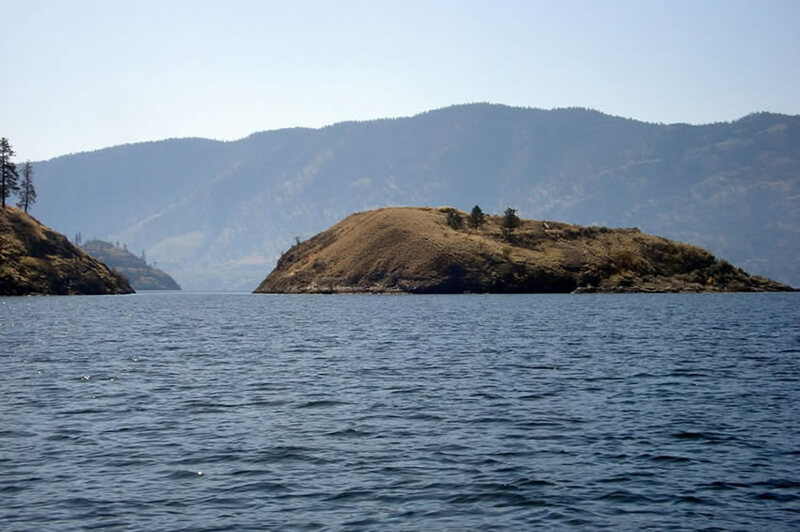 History tells us the local Indians paddled over from their Westside settlements near Peachland to offer sacrifices to the legendary sea monster, thereby ensuring their own safe passage across the rough and windy waters. Indeed, there are large caves situated along the rock wall under Squally Point's cliffs. 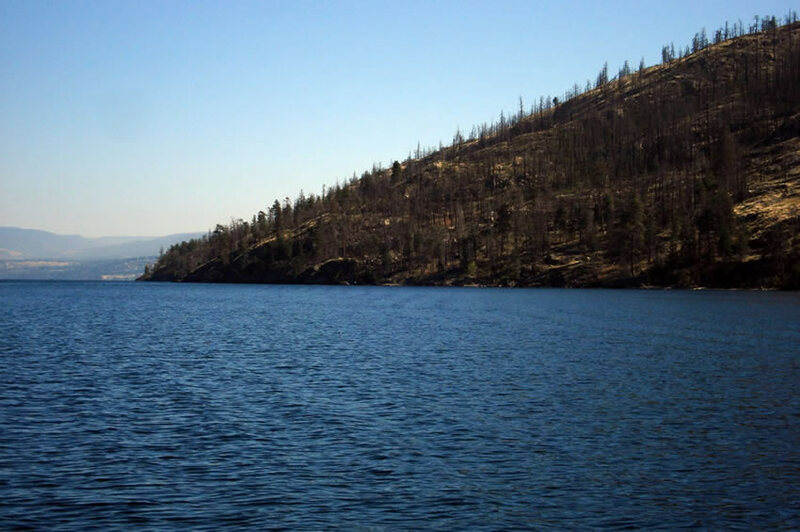 The lake takes a slight bend towards the northeast around Squally Point. 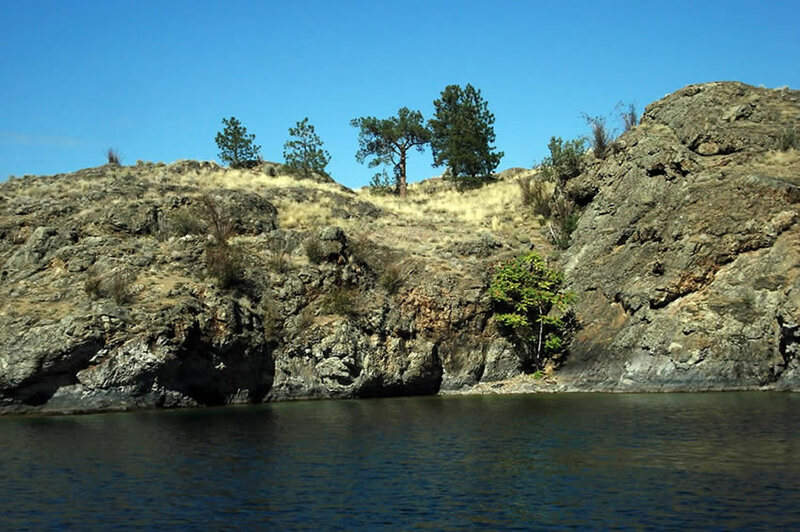 Just a few miles north you pass several bays and a rugged shoreline towards Rattle Snake Island. 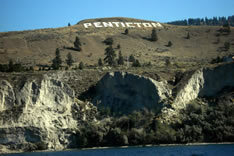 There are still signs of a mini-putt golf course that was built on the island back in the 1970s but never maintained. 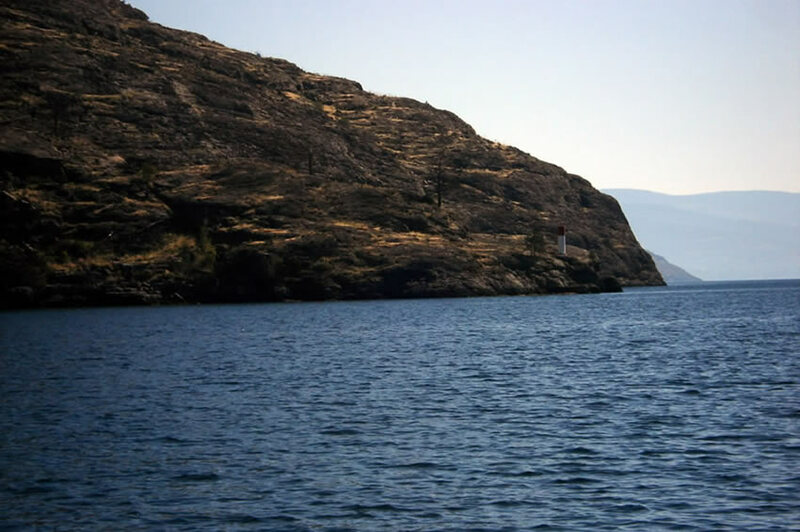 A few mooring buoys sit just south of the island for an overnighter if weather conditions permit. 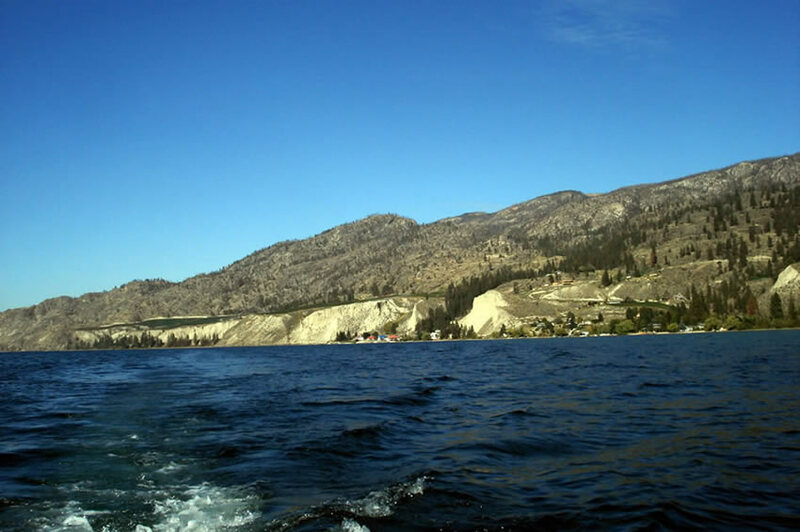 You can pass through between the Island and eastern shore during most times of the year. 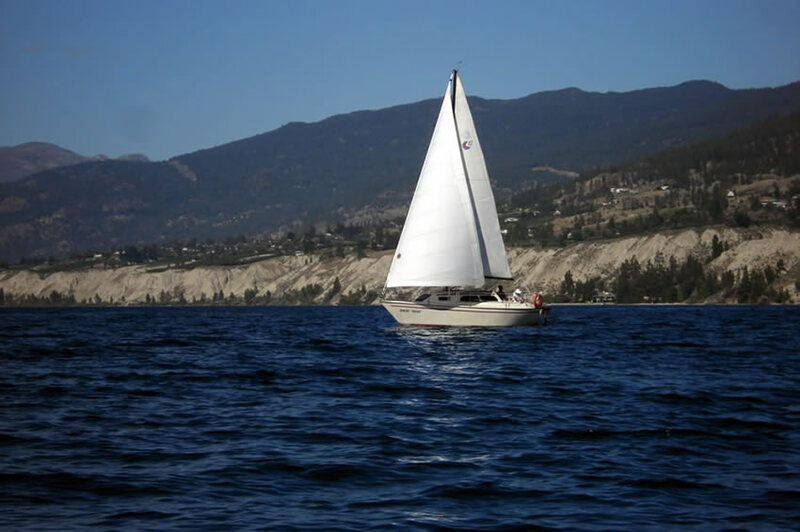 Always be careful of other boats – it is tight for two vessels to pass by one another here. 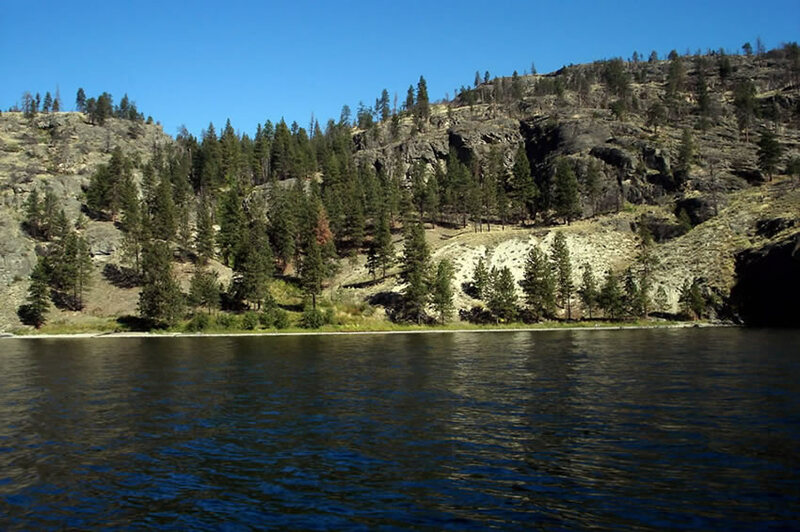 Heading north of Rattle Snake Island the sloped hills roll down below the steep mountains in the background. 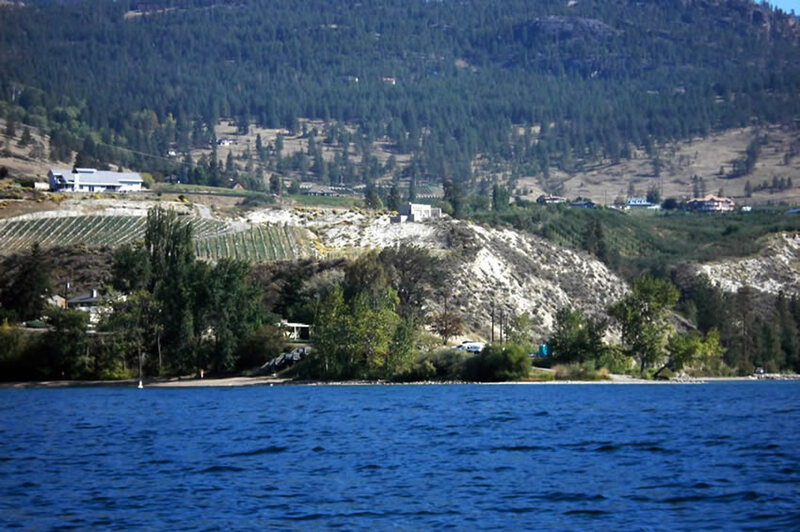 Burnt trees from the Okanagan Mountain Park fire are still visible as lakeshore homes and developments come into sight. 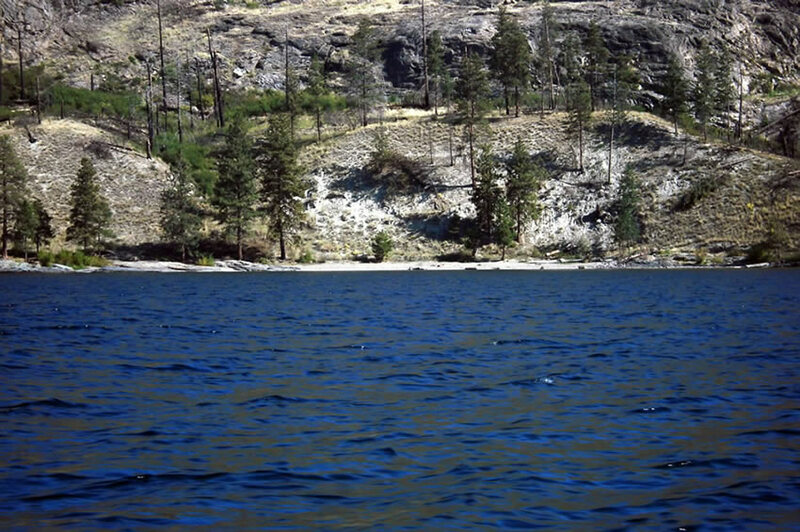 Scruggins Reef is one hazard along this stretch of shoreline, with shallow rocks sitting a couple of hundred feet offshore. 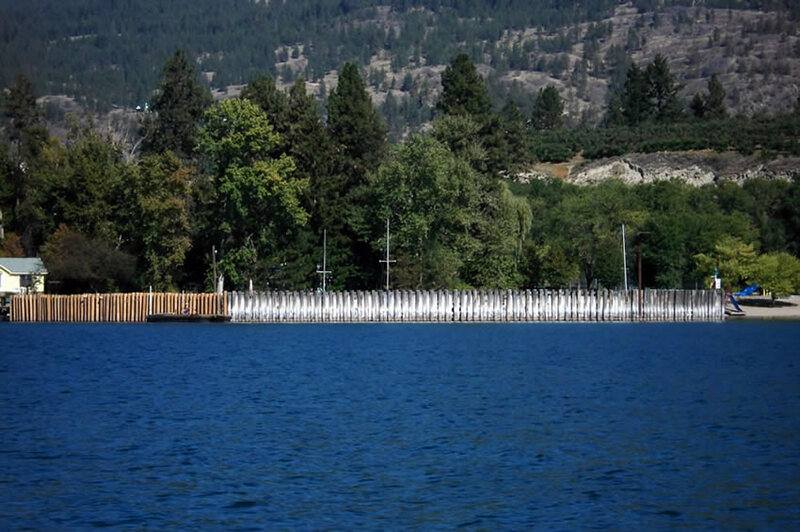 When the lake is a little low, you can spy a "propeller graveyard" sitting just below the waterline. 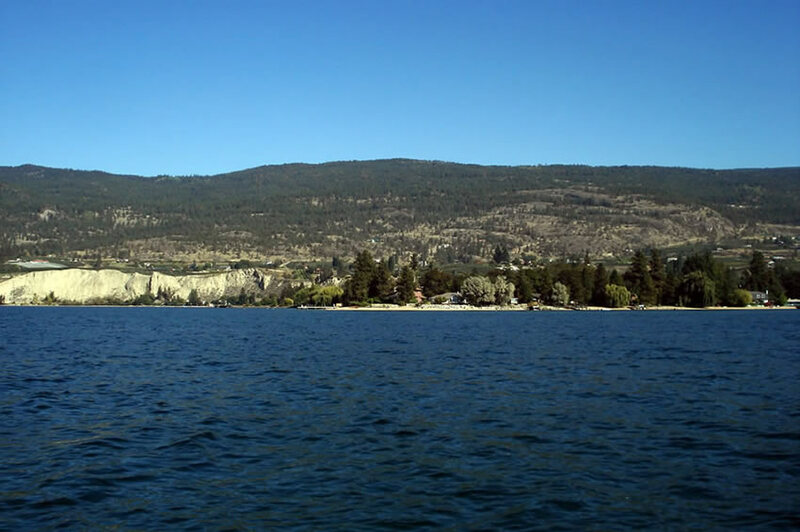 This point is where we end the Southern Okanagan Lake section. 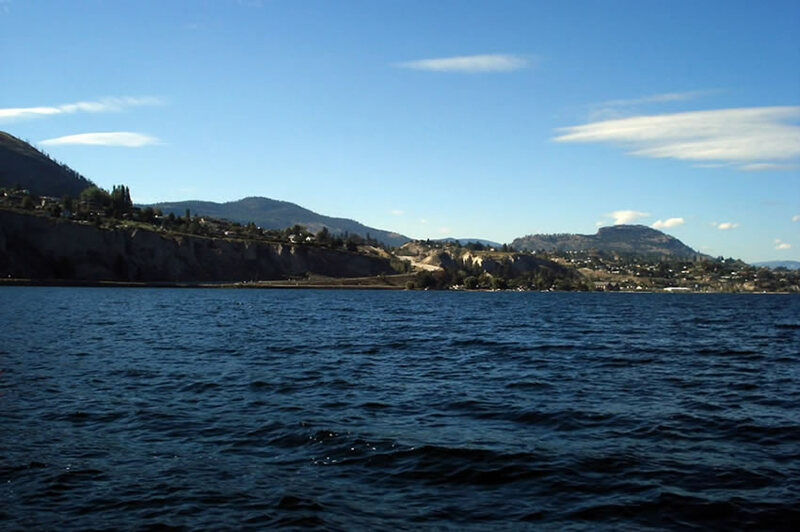 Please continue to the Central section of Okanagan Lake.